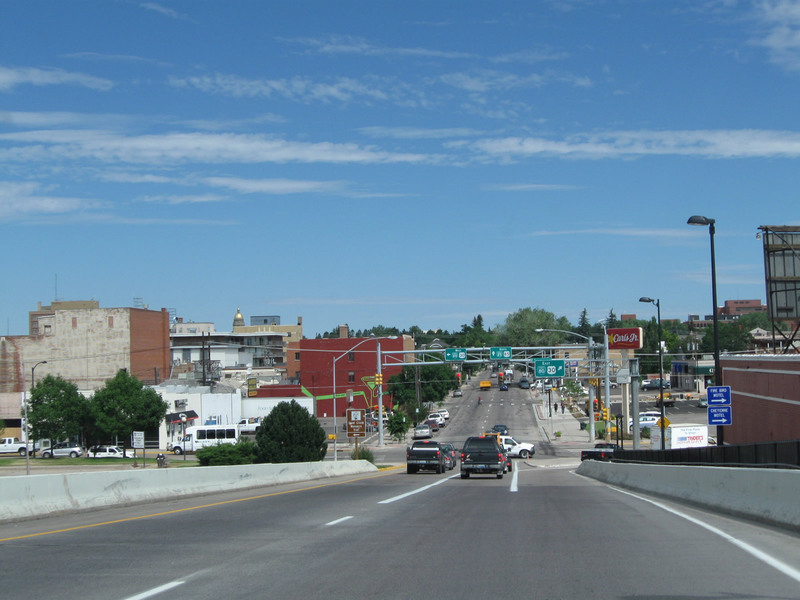 Interstate 180 follows Central Avenue between Interstate 80 Exit 362 and Business Loop I-80 and U.S. 30/Lincolnway in downtown Cheyenne. 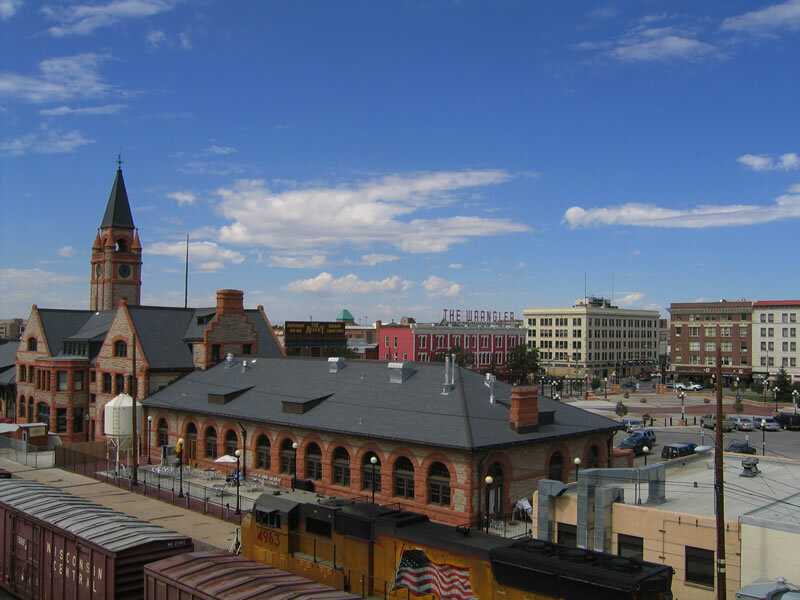 The route is approximately a mile long, and its most prominent feature is the sweeping pair of viaducts that cross over the Union Pacific Railroad yard. 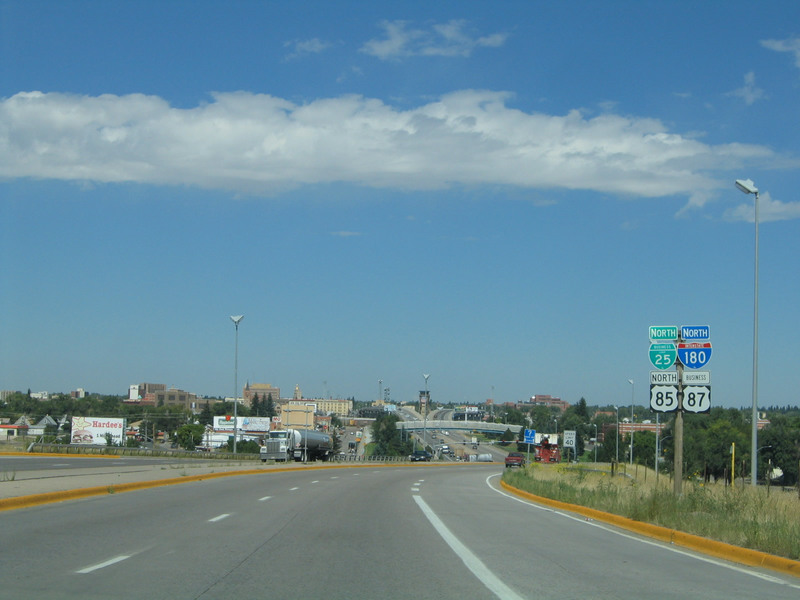 Interstate 180 is also notable for not being a freeway (it has traffic lights along its mainline) and for being signed along with Business Loop I-25, U.S. 85, and Business U.S. 87. it is the only known instance where an Interstate highway, Business Interstate highway, U.S. route, and Business U.S. route are all signed together on one road. This northbound reassurance route marker is posted after the Interstate 80 interchange. It has since been replaced, and the new shield for Interstate 180 now contains the state name. Photo taken 08/02/10. 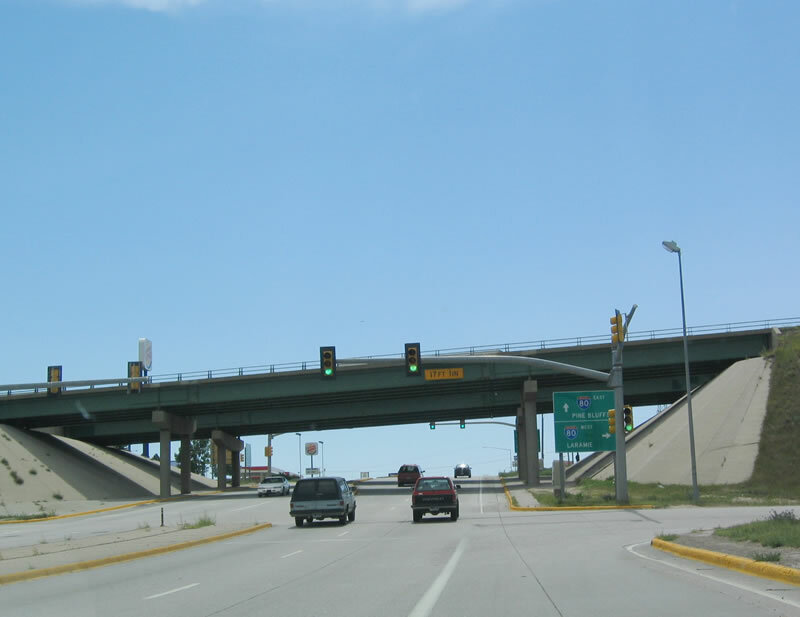 Interstate 180 in Wyoming runs from Interstate 80 Exit 362 (U.S. 85 and Central Avenue interchange) north to Business Loop I-80 and U.S. 30 (Lincolnway) via the Union Pacific viaduct. We located a Wyoming Department of Transportation publication from the late 1990s that indicates Interstate 180 is the "shortest Interstate highway," but there are a few others that are shorter, with Interstate 878 in New York being the shortest. Interstate 180 is unique in that it is not freeway grade or "Interstate standard" at all for its entire length, excepting perhaps the twin viaducts over the Union Pacific Railroad. It has no interchanges except the diamond interchange at Interstate 80. 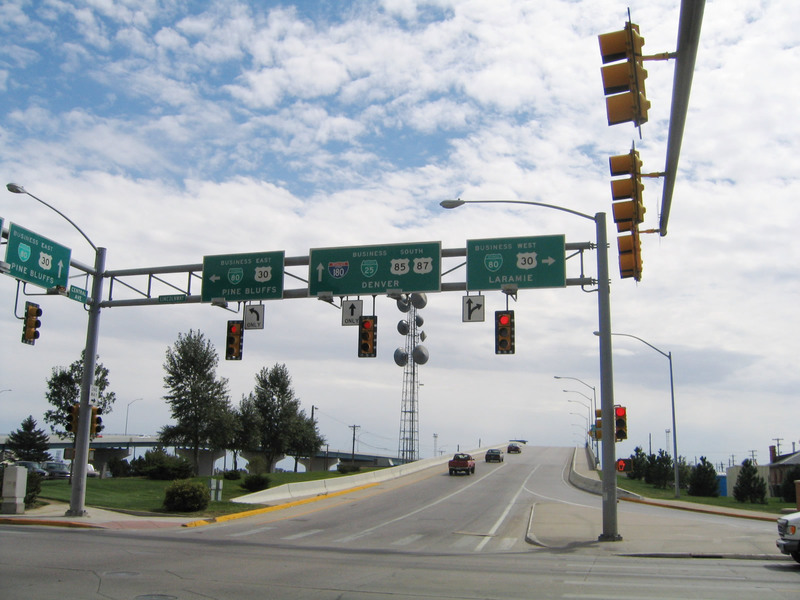 As you drive north from Interstate 80, you hit four at-grade stoplights that are "exits" from Interstate 180. WEST Laramie The Interstate 80 junction with Interstate 180 is simply a diamond interchange with stoplights at the base. There is no "freeway-to-freeway connection" normally associated with an dual Interstate highway junction. Exit 0C Fifth Street (Campstool Road) This "exit" is the third stoplight heading northbound. Between the Fifth and Ninth Street stoplights there is a pedestrian overcrossing. Exit 0D Ninth Street The fourth stoplight is at the southern base of the Union-Pacific viaduct. 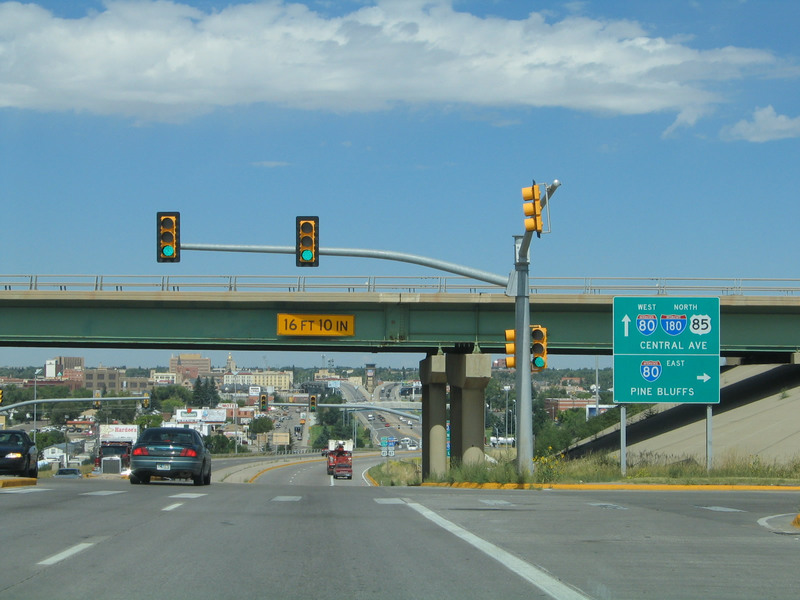 WEST: Laramie Interstate 180 ends at this fifth and final stoplight. There are no signs that indicate its northern end. 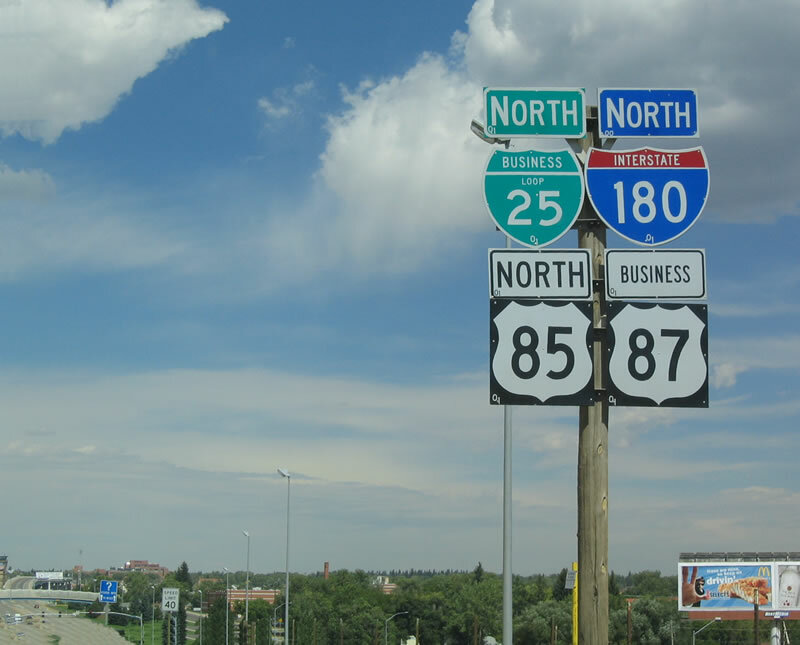 Reassurance signs north of Lincolnway along Central Avenue only indicate Business Loop I-25, U.S. 85, and Business U.S. 87. 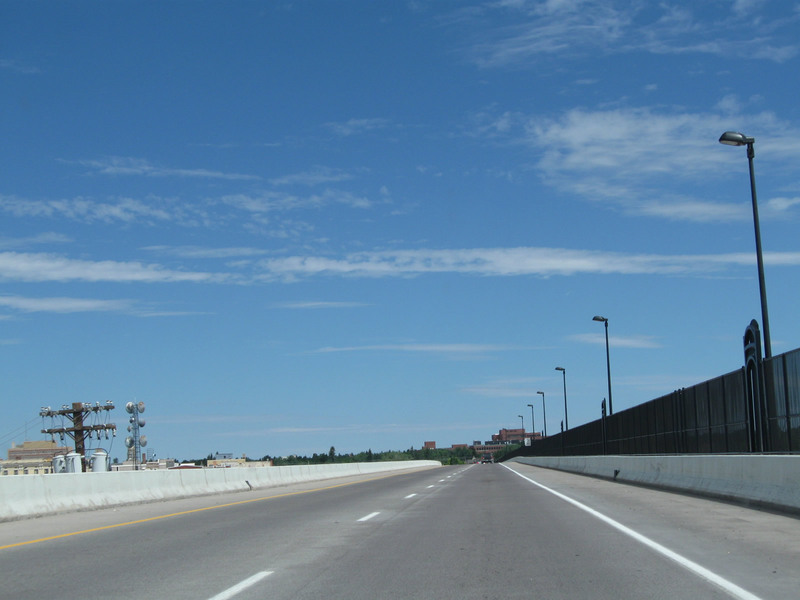 After six-and-a-half years of construction, Interstate 180 in Cheyenne was opened in its entirety during a grand opening ceremony conducted June 1, 1984. Partial openings occurred in 1979 and 1982. 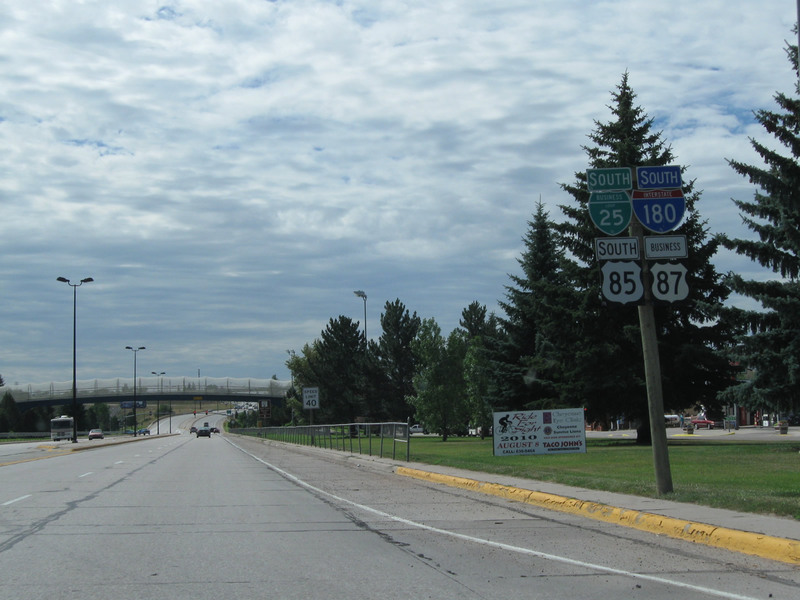 Between 1977 and 1984, the Wyoming Highway Department (today known as the Wyoming Department of Transportation) embarked on a $21 million project to upgrade old U.S. 85 between Interstate 80 and U.S. 30 (Lincolnway) in Cheyenne. Much of the money for the Interstate 180 project came from federal sources, which is partially why Interstate 180 is part of the Interstate highway system. 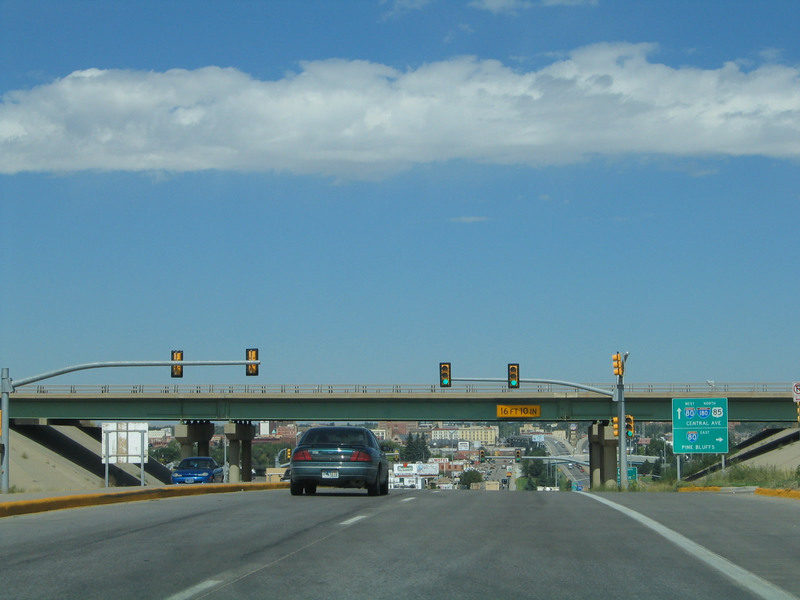 The other reason is a "loophole" in the rules: the federal government provided Wyoming the Interstate mileage without requiring the state to meet the "Interstate standards" normally required of all roads carrying the Interstate shield. 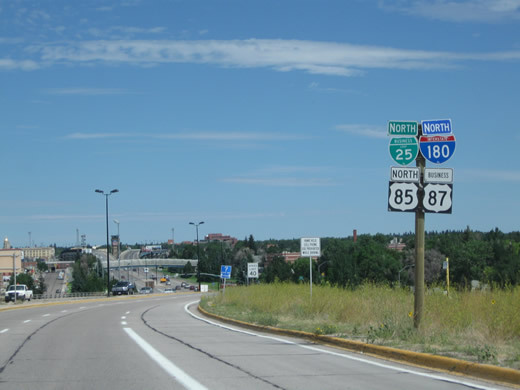 Wyoming transportation officials and FHWA initially planned Interstate 180 to be up to Interstate standards until the early 1970s. 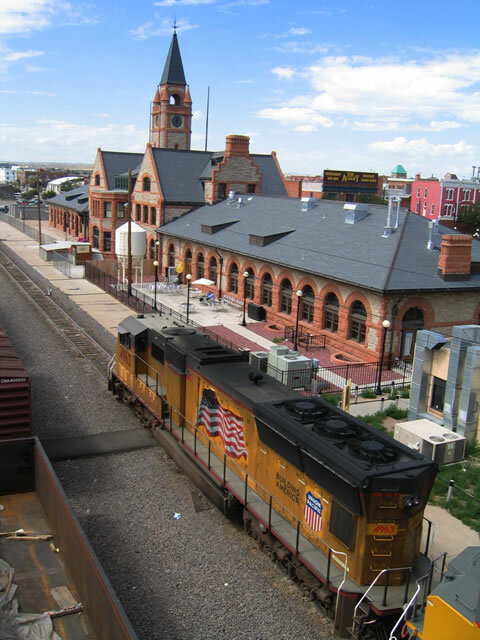 However, the plans were modified to make Interstate 180 an at-grade expressway so residents on the south side of Cheyenne could more easily cross the Union Pacific Railroad into downtown Cheyenne and to cut costs. Since the Wyoming Highway Department (now WyoDOT) and FHWA had already spent federal funds on the design of Interstate 180, it was allowed to keep its Interstate designation despite the sub-Interstate standard design of the highway. 1965. 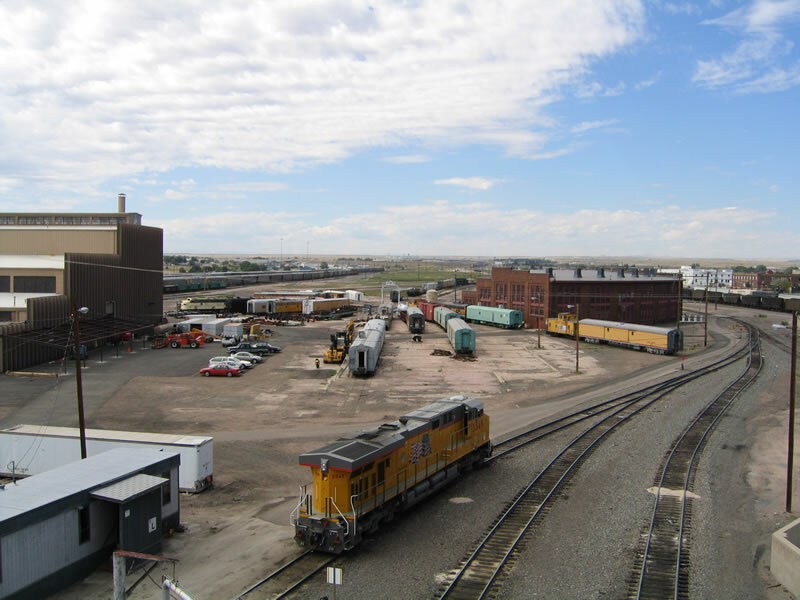 Interstate 180 had its beginning in the mid-1960s, when the Wyoming Highway Department (now WyoDOT) began planning an enlarged route through the south side and over the railroad yards. 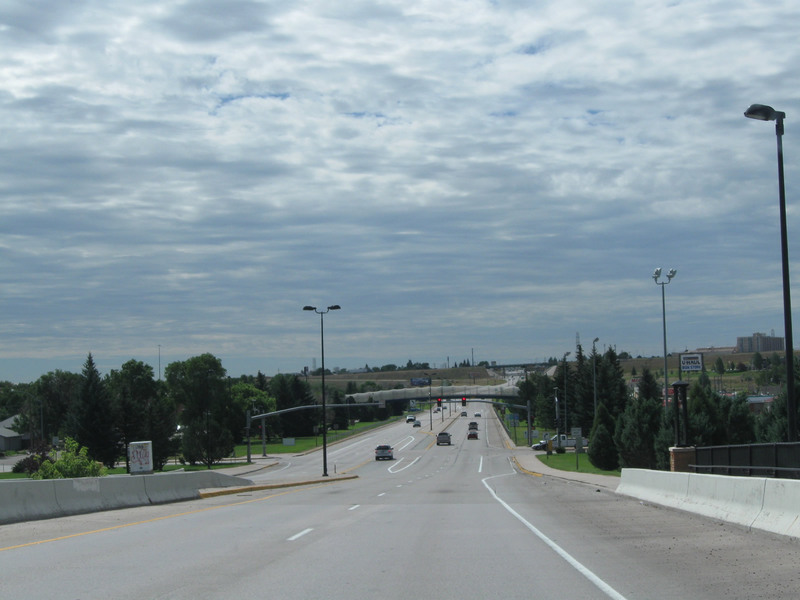 Completion of Interstate 80 between Central Avenue (South Greeley Highway) and Interstate 25 west of town in June 1966 accentuated the need for a major roadway to connect Interstate 80 with the central business district. 1967. In the fall of 1967, a request was made to the U.S. Bureau of Public Roads (now Federal Highway Administration) to grant Interstate status for the proposed improvement. That request was approved on Feb. 2, 1968. 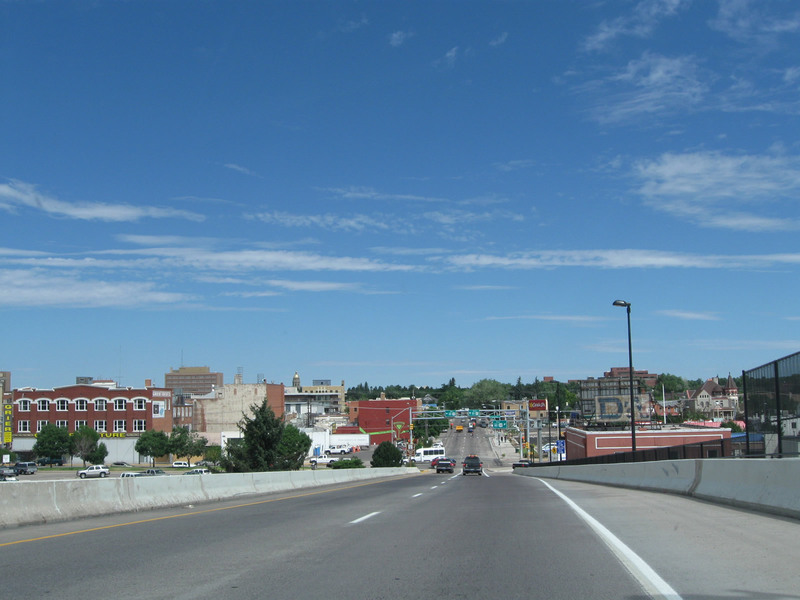 Initially, the route was referred to as a controlled-access "ramp" from Interstate 80 to downtown Cheyenne. 1969. 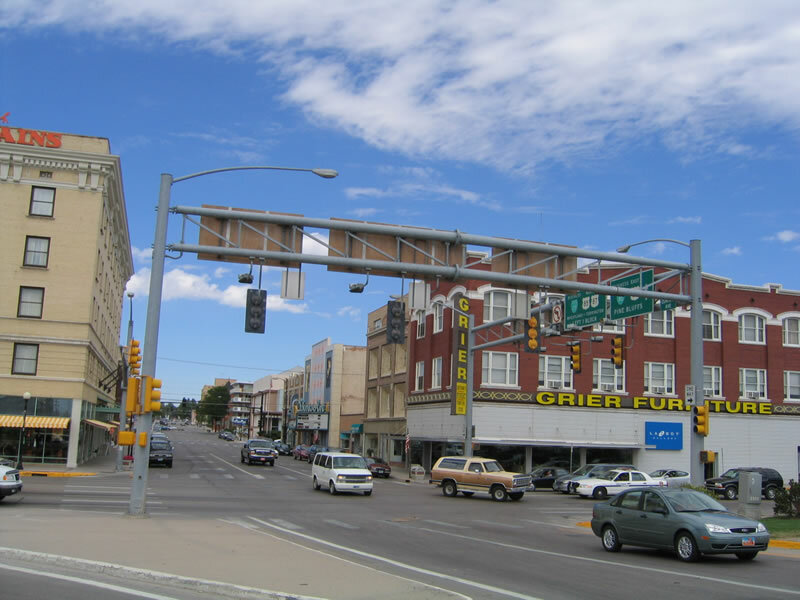 On March 20, 1969, the "controlled-access ramp" proposed into Cheyenne was reclassified as an urban spur route and given the "Interstate 180" designation. 1970. According to the original plan put forth in the Central Avenue Corridor Study (issued in September 1970), Interstate 180 was to be a fully controlled access freeway, with no at-grade crossings between 16th Street and Interstate 80. The roadway was to be elevated for its entire distance. FHWA officials denied approval of the elevated roadway plan because of its relatively high cost and because they didn't feel there was sufficient access to the new roadway from the south side. 1971. A revised plan, submitted in February 1971, called for an at-grade expressway with access at two points (5th and 9th Streets) and which would cost only about half as much as the original plan. FHWA approved the scaled-down version within a month. 1973. Additional study and preliminary right-of-way acquisition then began, and by April 1973, clearance of the one-block wide corridor through the south side had begun. Mid-1970s. This process continued through the mid-1970s, with final design plans for the 0.6 mile of Interstate 180 southward from 9th Street to Interstate 80 being readied by early 1977. A snag in final right-of-way acquisition delayed the actual physical work until the 1978 construction season. 1977. The first phase of widening U.S. 85 between Interstate 80 and the old Riner Viaduct begins. 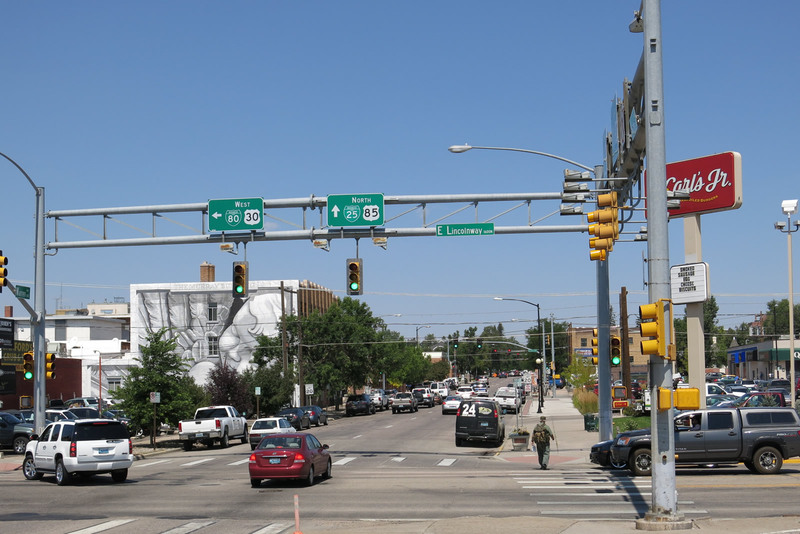 This phase involves widening U.S. 85 to four lanes and developing the road into an urban spur route from Interstate 80 to downtown Cheyenne. At this point, the two-lane Riner Viaduct remains in place. 1978. Construction continued through 1978 and much of 1979. At the same time, designers were putting the final touches on plans for the twin Interstate 180 bridges that would span the railroad yards. A May 23, 1980 ground-breaking ceremony marked the beginning of work on the first (northbound) of the two bridges. Substructure work (pilings, footings and piers) was accomplished during 1980-81, and superstructure (girders and deck) was built in 1981-82. 1979. The four-lane highway section of Interstate 180 is completed at a cost of $3.4 million. 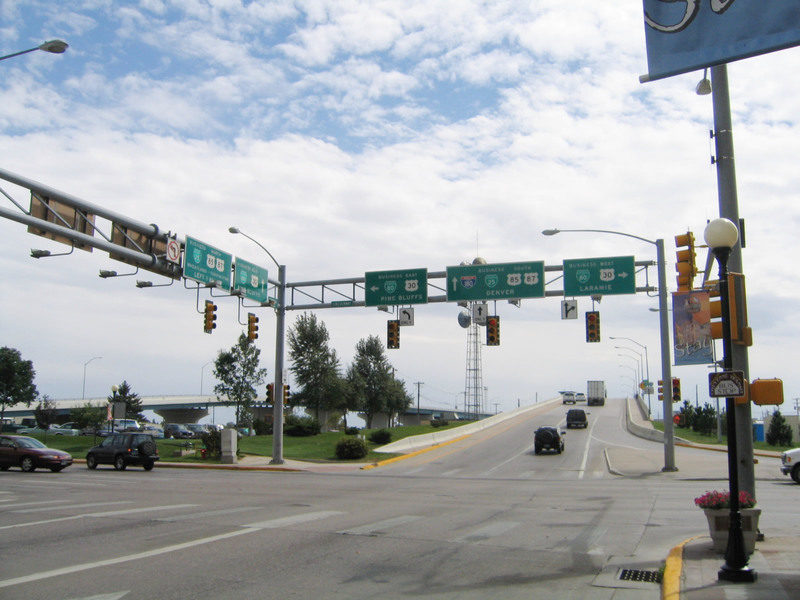 Traffic lights control the traffic at the Interstate 80 entrance and exit ramps, Fifth Street, and Ninth Street. There are no plans to upgrade this controlled access highway to full-freeway status. The speed limit is set at 40 miles per hour. Attention is directed to the viaduct over the Union Pacific Railroad yards. 1982. One of the two Interstate 180 spans over the railyards is completed. Traffic is rerouted over this one span, and the old Riner Viaduct is razed. The Riner Viaduct had carried traffic over the railyards since 1929. Construction continues on the second span. 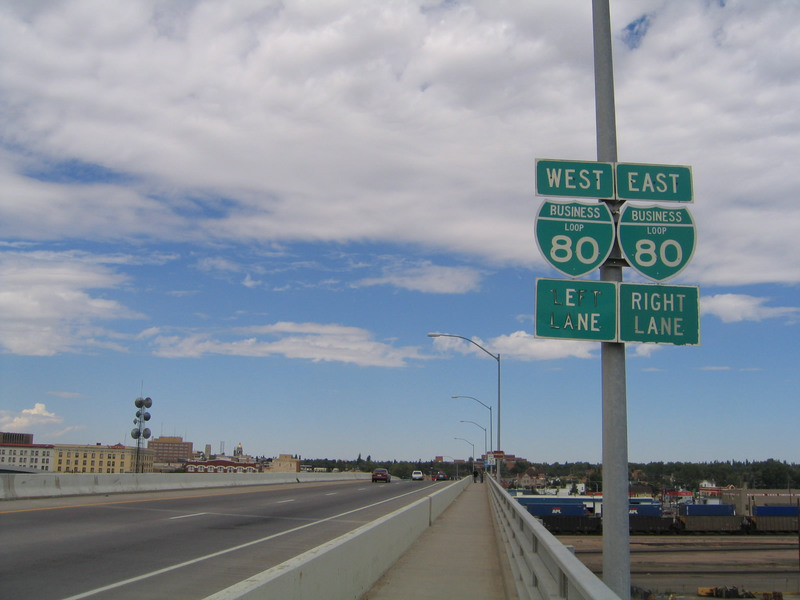 Interstate 180 is signed on Central Avenue for the first time; it did not appear on official State of Wyoming highway maps until 1985. 1983. Although work on the second Interstate 180 bridge was substantially complete by the fall of 1983, cold weather set in before final paving could be accomplished, and thus it was the spring of 1984 before the grand opening could occur. 1984. Second span over railyards completed. A park and parking lot adjacent to Interstate 180 are constructed. 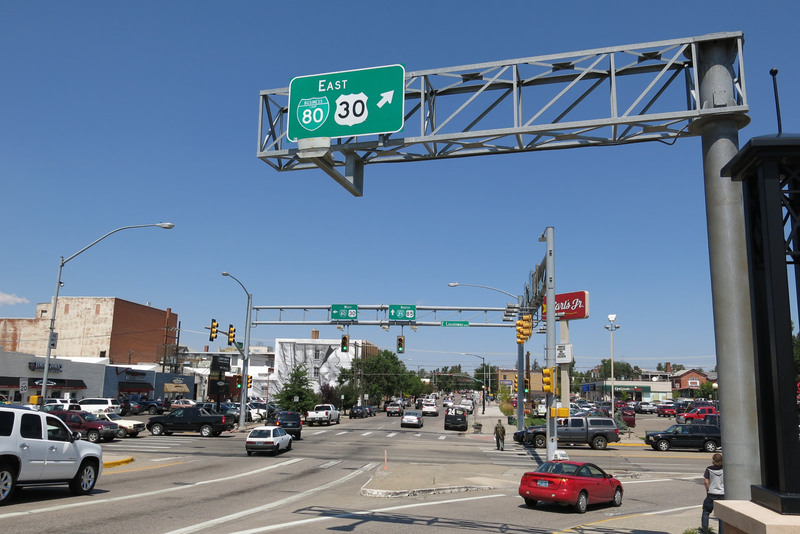 There are no further plans to upgrade Interstate 180, making it one of the few, if not the only, Interstate Highways in the country with traffic lights on its mainline. 1997. Interstate 180 handled an average of 20,000 vehicles per day. 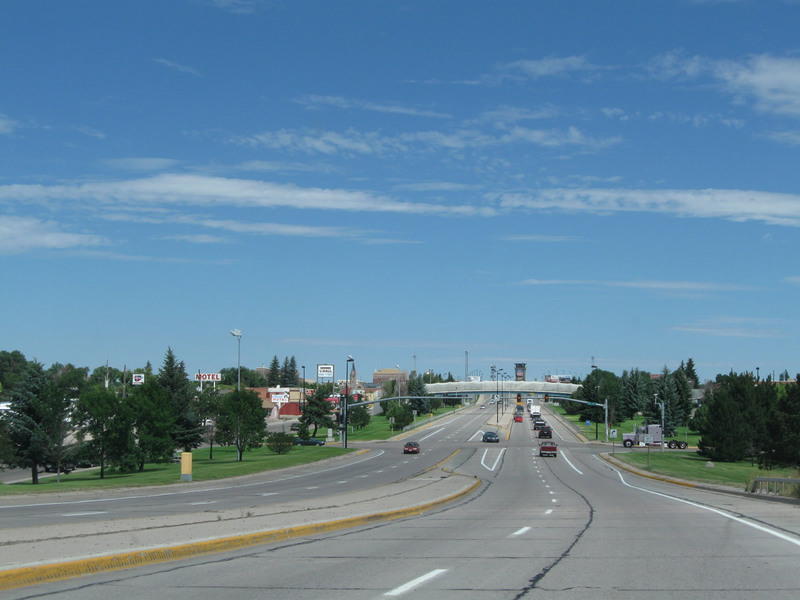 The south side of the interchange between Interstate 80 and Interstate 180 has an array of fast food, motels, and truck stops. The access to these facilities is from U.S. 85, not Interstate 180, as Interstate 180 does not travel south of Interstate 80. 2005. 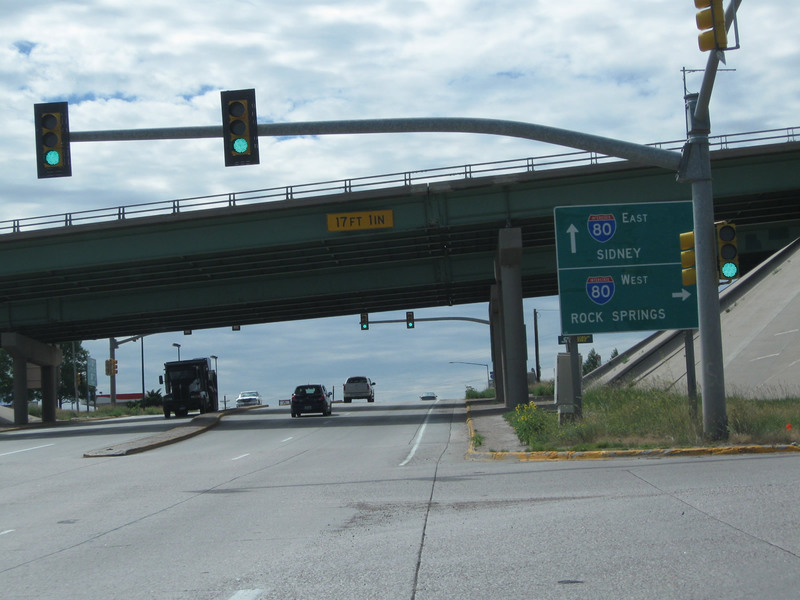 According to the Cheyenne Metropolitan Planning Organization, Interstate 180 is planned for some aesthetic changes. This includes pedestrian enhancements at the Lincolnway intersection, "attractive" fencing for the twin viaducts, drought tolerant landscaping, public art, banners, and related streetscaping features. 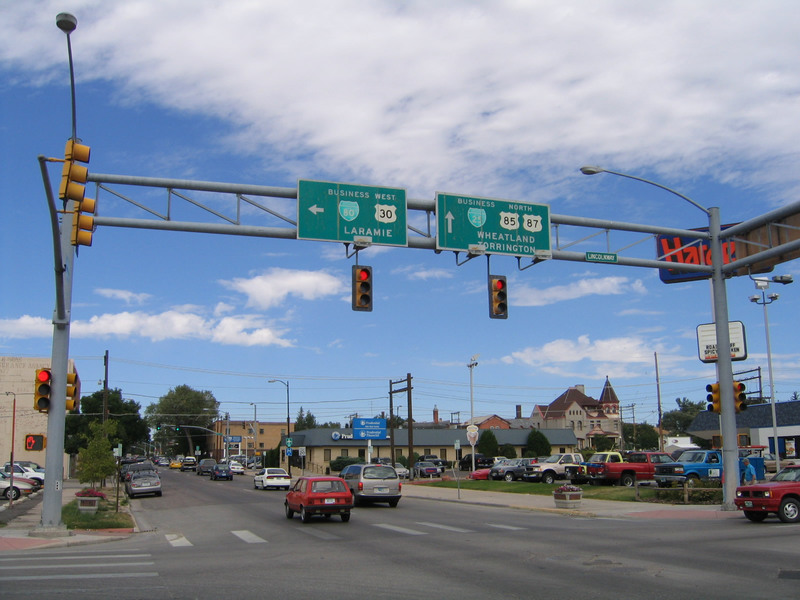 These improvements are geared to improve the image of Interstate 180 as the gateway to downtown Cheyenne. 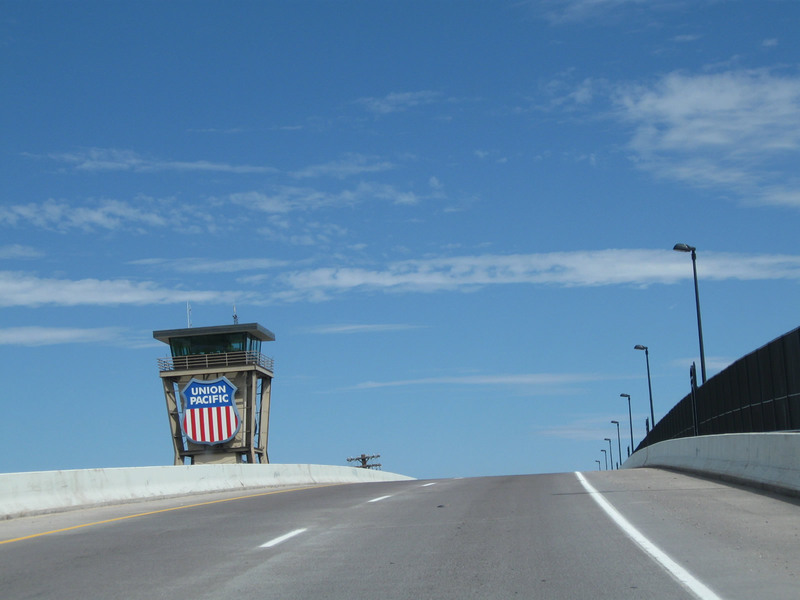 The twin Interstate 180 bridges over the Union Pacific Railroad yards are two lanes in each direction, with a partial climb lane over the southbound bridge. To protect it against ice and snow, the bridges have a geothermal heating system with 14 miles of pipe located in and underneath the northside approaches. An ammonia vaporization process provides the heat to reduce ice and snow on the northside. The heating system is necessary because the warming rays of the sun do not reach the back side of the viaduct in the winter. The support pillars for the bridge range from 19 to 41 feet tall and 53 feet wide at the top, with steel girders weighing as much as 30 tons each. 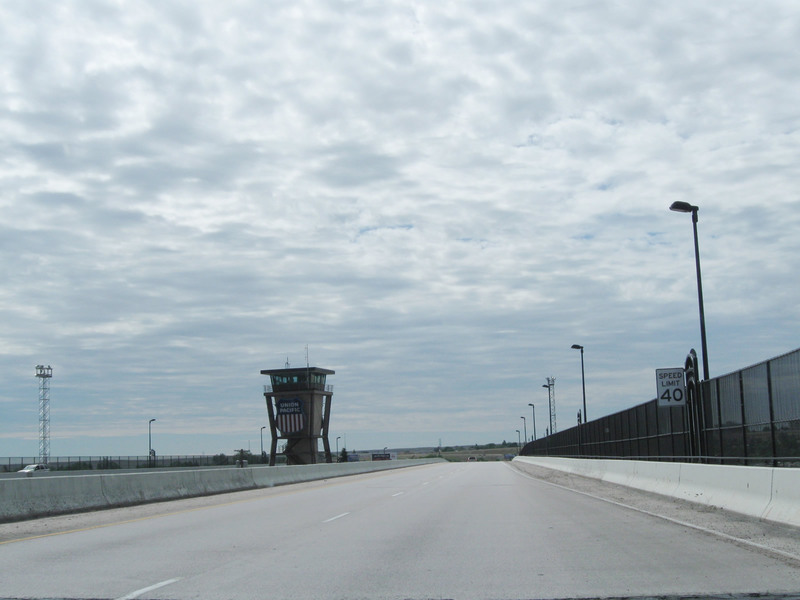 A Union Pacific control tower stands like a sentinel between the bridges; the tower is still used by railroad personnel today. 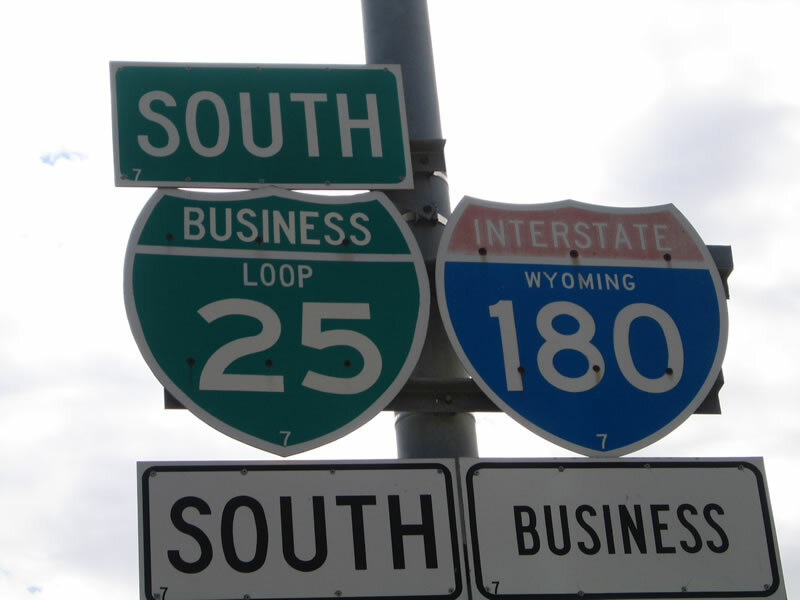 Interstate 180 is co-signed with Business Loop I-25, U.S. 85, and Business U.S. 87. This is the only place where an interstate, business loop, U.S. route, and business U.S. route are joined together. It is reminiscent of Van Buren Street in Phoenix, Arizona, which used to be Business Loop Interstate 10, U.S. 60-70-80-89, and Arizona 93. 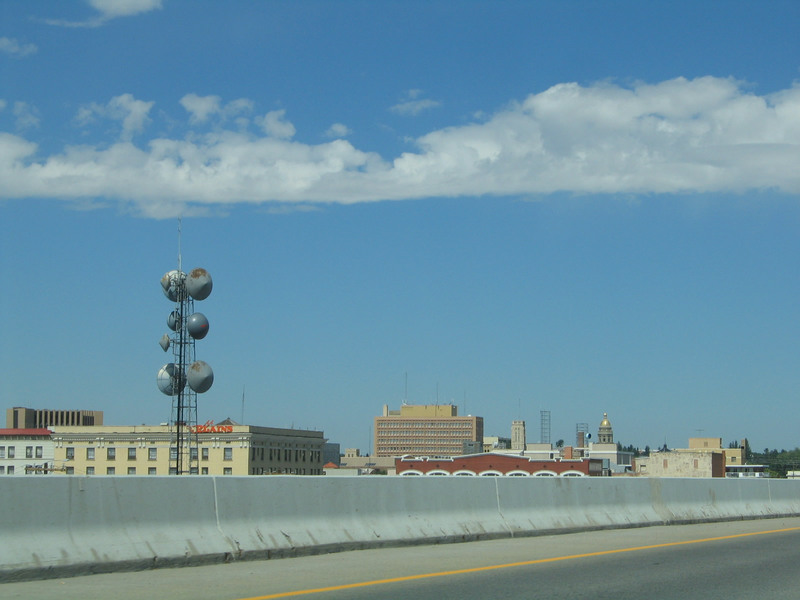 At least Central Avenue (Interstate 180, Business Loop I-25, U.S. 85, and Business U.S. 87) only carries four routes. 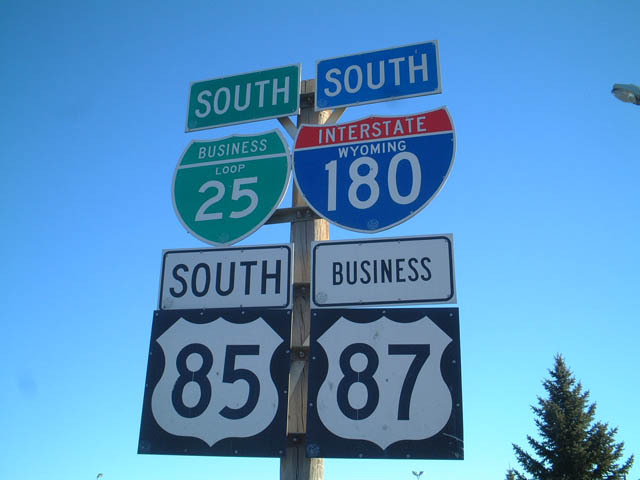 In the 2010s, newer signage appears to have deemphasized Business U.S. 87, but it is still signed on reassurance route markers. 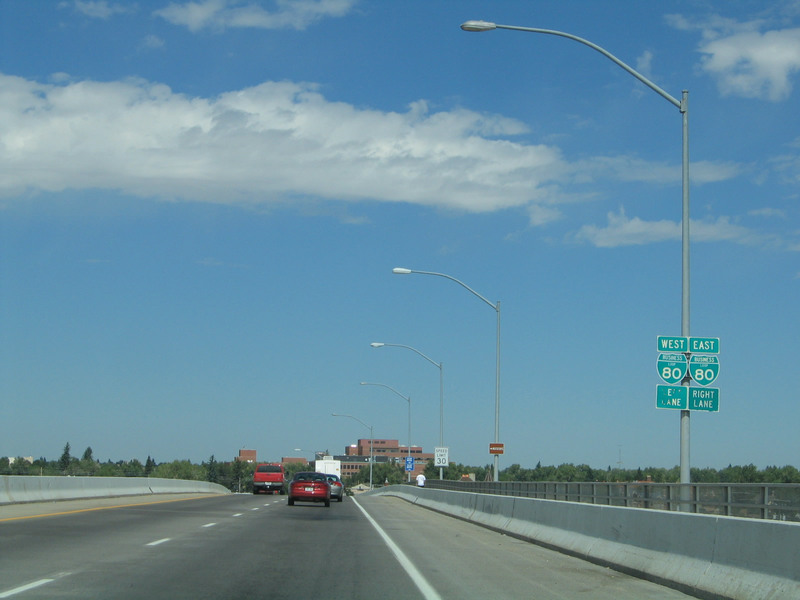 The exit signs for Interstate 180 on mainline Interstate 80 only show Interstate 180 and U.S. 85, Central Avenue and Greeley as a control city for south U.S. 85. 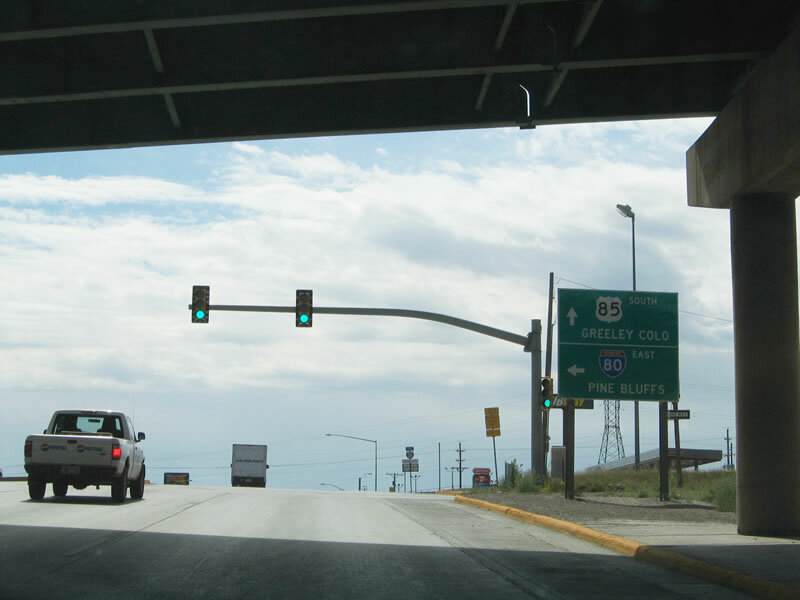 Like many states, Wyoming does not sign business loops on exit signs unless it is the beginning or end of the business loop. 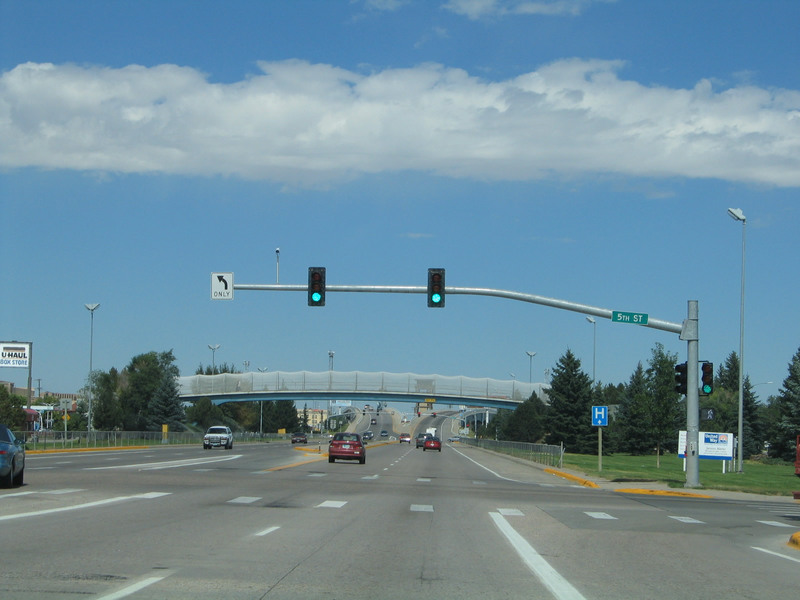 Northbound Business Loop I-25, U.S. 85, and Business U.S. 87 (South Greeley Highway) transitions directly onto northbound Interstate 180 (Central Avenue) upon passing under Interstate 80 in Cheyenne. Photo taken 09/07/05. 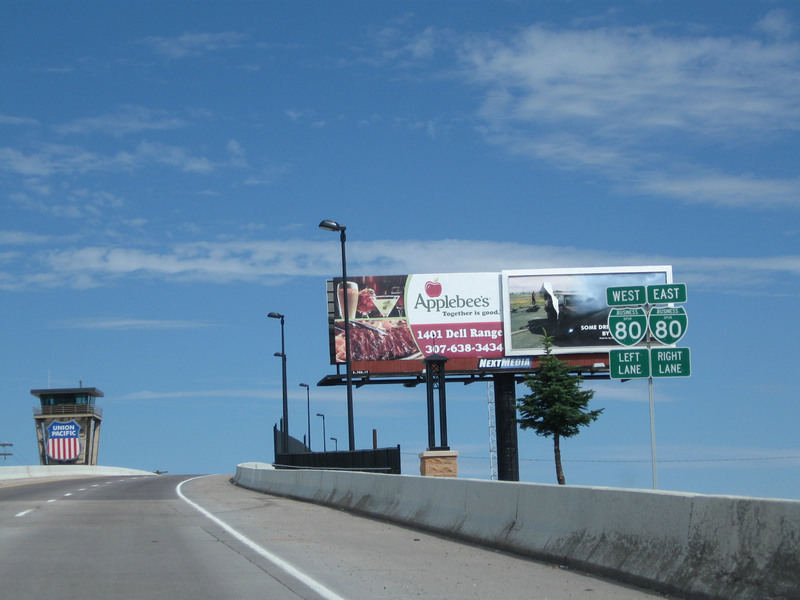 This is the first trailblazer sign for northbound Interstate 180 to be seen from northbound U.S. 85, Business Loop I-25, and Business U.S. 87. 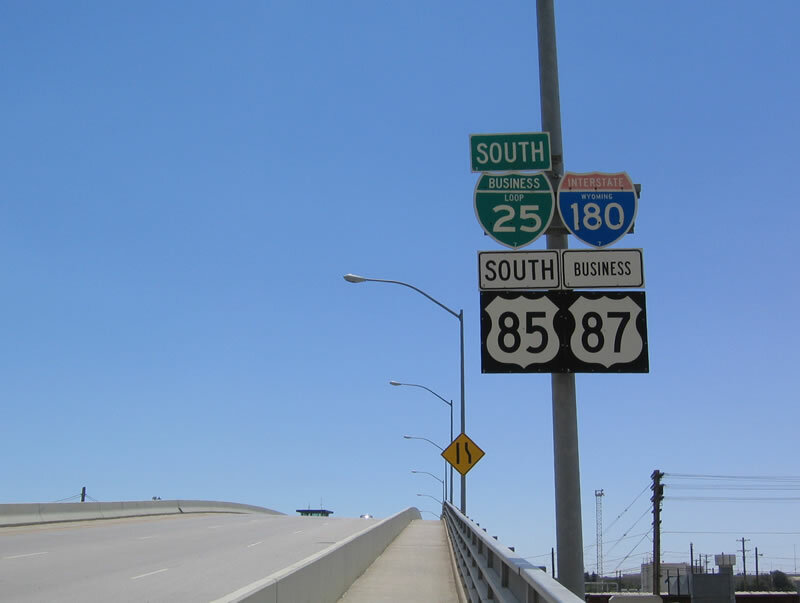 The two business routes are not mentioned on most of the guide signs, but U.S. 85 and Interstate 180 generally are mentioned. 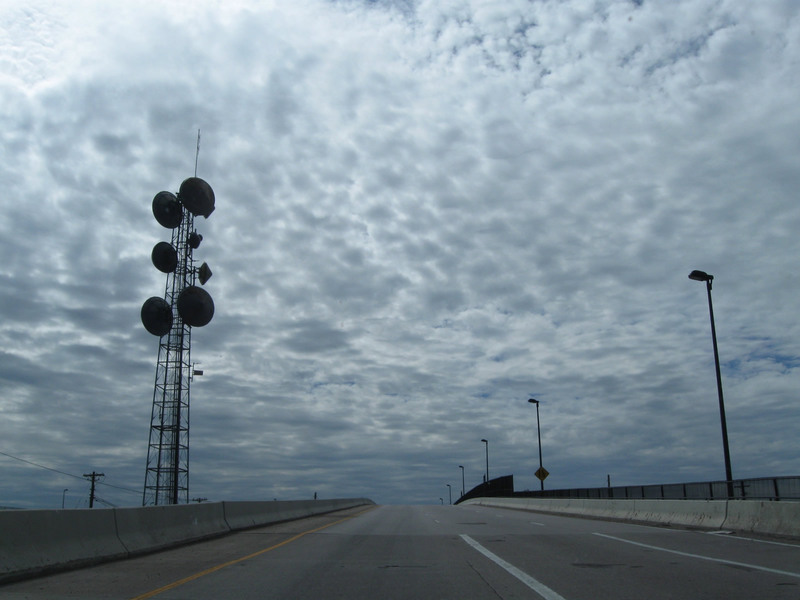 At the Fifth Street and Ninth Street traffic signals, the mast arms identify the highway as "I-180." 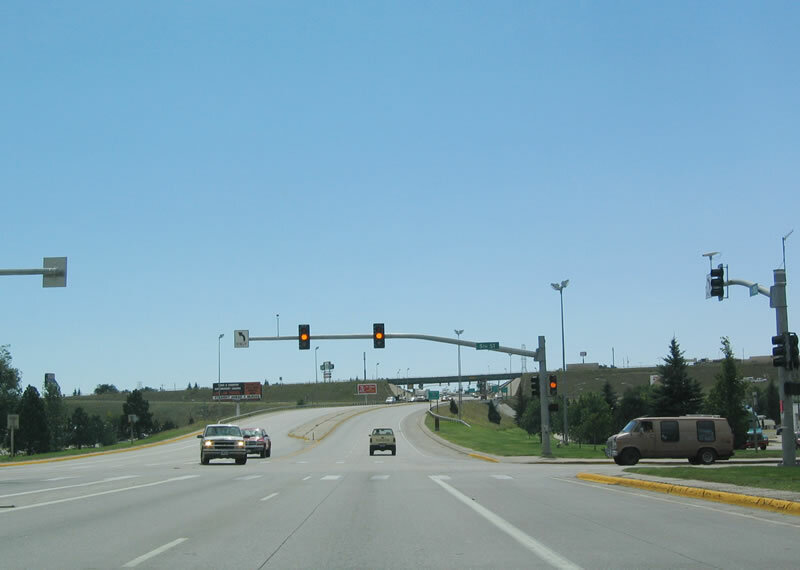 This traffic signal is the ramp connection to eastbound Interstate 80 en route to Pine Bluffs and Nebraska. Photo taken 09/07/05. Northbound Interstate 180 and U.S. 85 pass under Interstate 80. 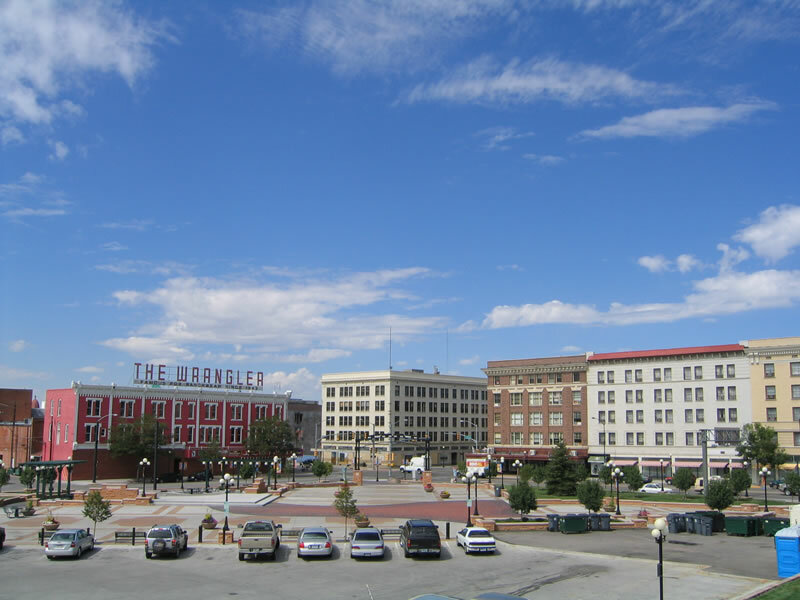 The valley formed by Crow Creek cradles downtown Cheyenne; notable buildings include the state capitol building and a variety of mid-rise, western style buildings. Photo taken 08/02/10. 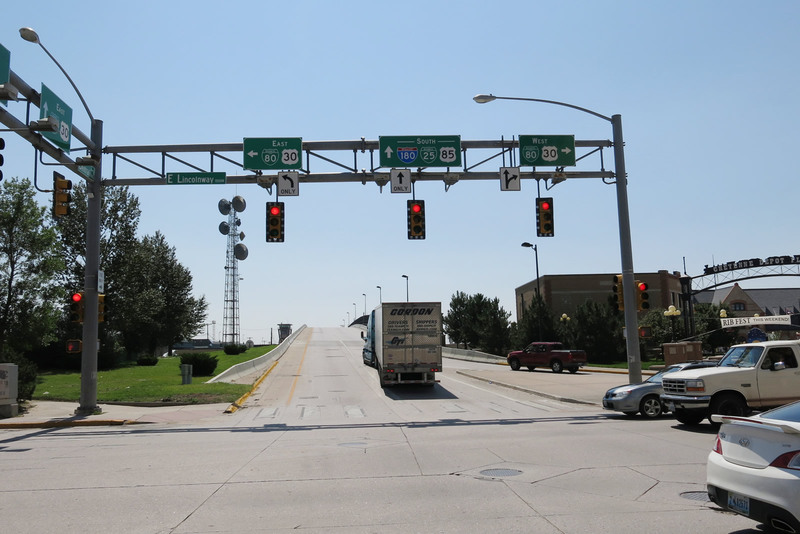 After passing under Interstate 80, a left turn at this traffic signal connects to westbound Interstate 80 en route to Laramie and Interstate 25. 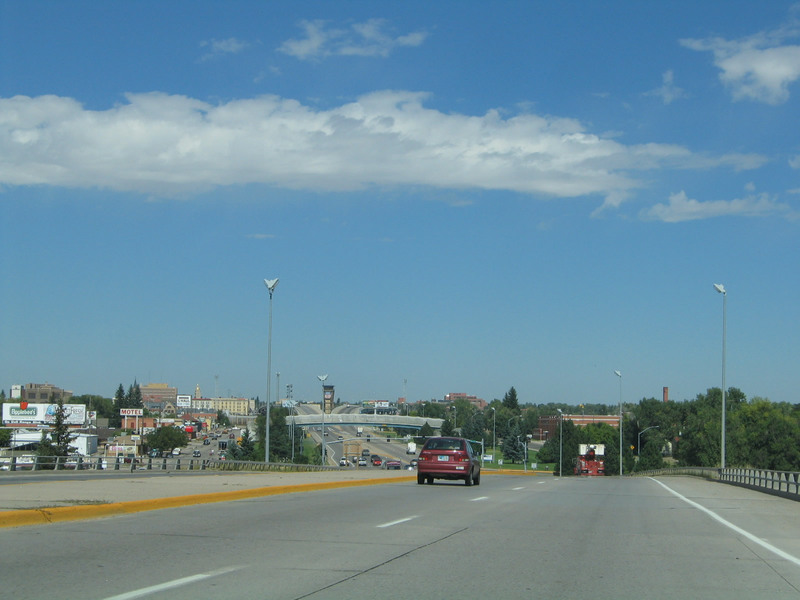 Interstate 180 (and Business Loop I-25, U.S. 85, and Business U.S. 87) continue straight ahead toward downtown Cheyenne. Photos taken 08/02/10 and 09/07/05. 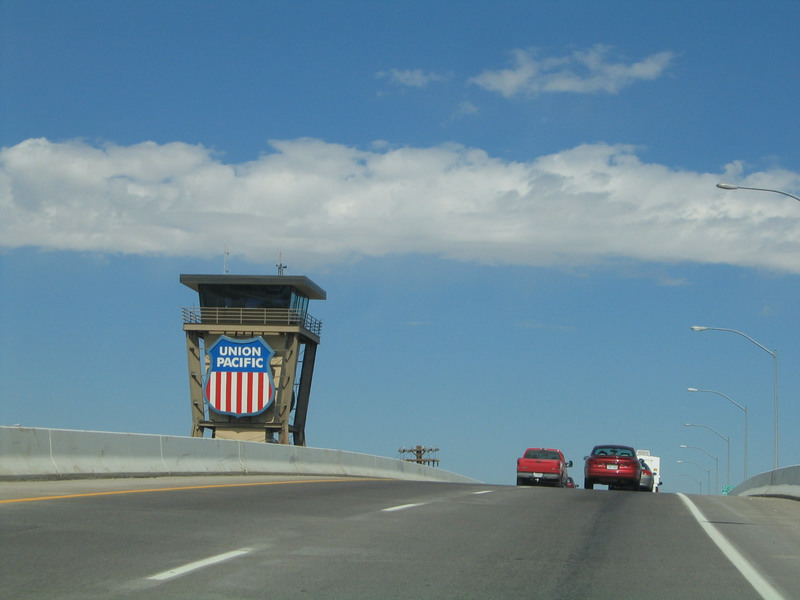 This is the first reassurance shield assembly on northbound Interstate 180 (and Business Loop I-25, U.S. 85, and Business U.S. 87). 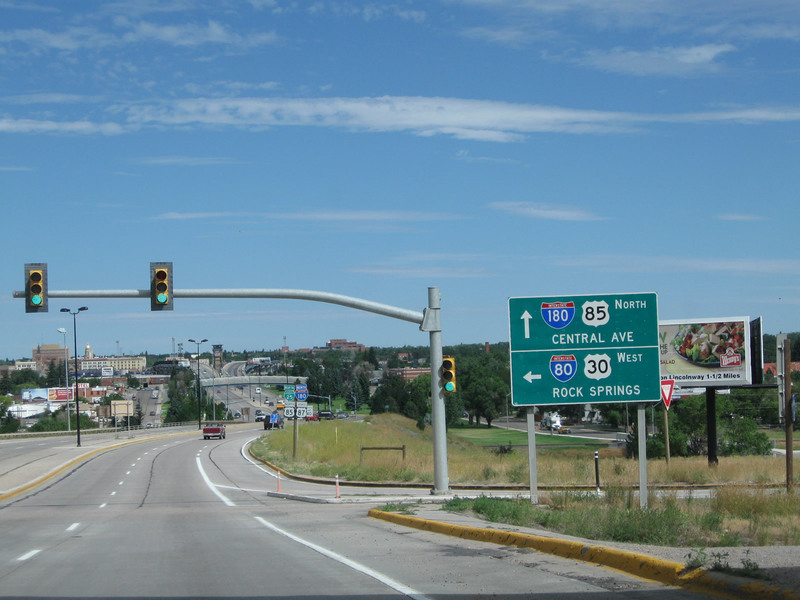 Notably, Interstate 180 is given a lesser status than Business Loop I-25, even though the guide signs generally omit Business Loop I-25 at the Interstate 80 diamond interchange. 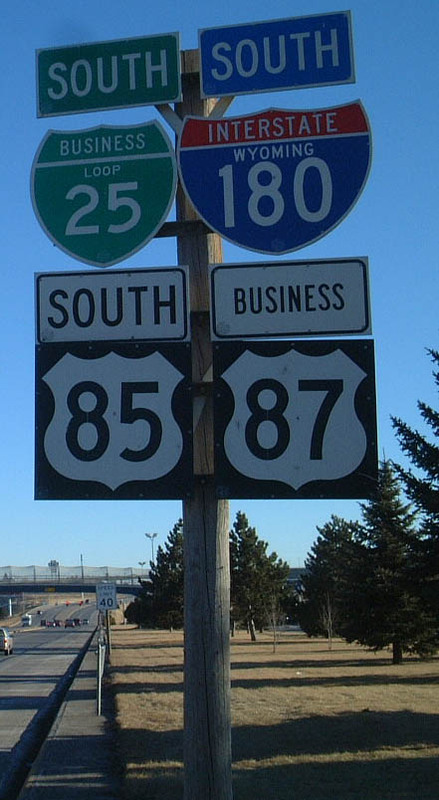 Note that the Interstate 180 shield is neutered; it was replaced in 2001. The previous shield contained the state name. Photos taken 09/07/05. 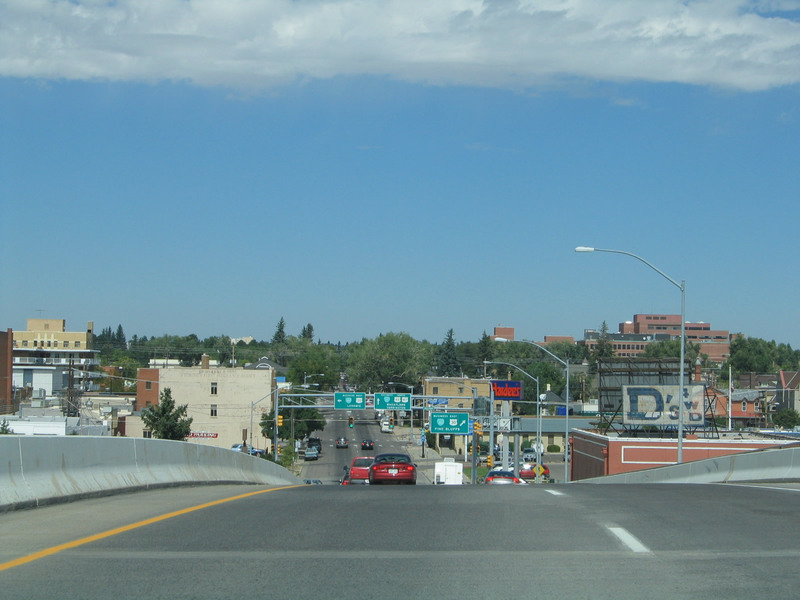 After the initial route marker assembly, Interstate 180 crosses over Deming Drive and Crow Creek. Frontage roads line Interstate 180 on either side of the expressway. Interstate 180 has standard shoulders and a low concrete median barrier. Photos taken 08/02/10 and 09/07/05. 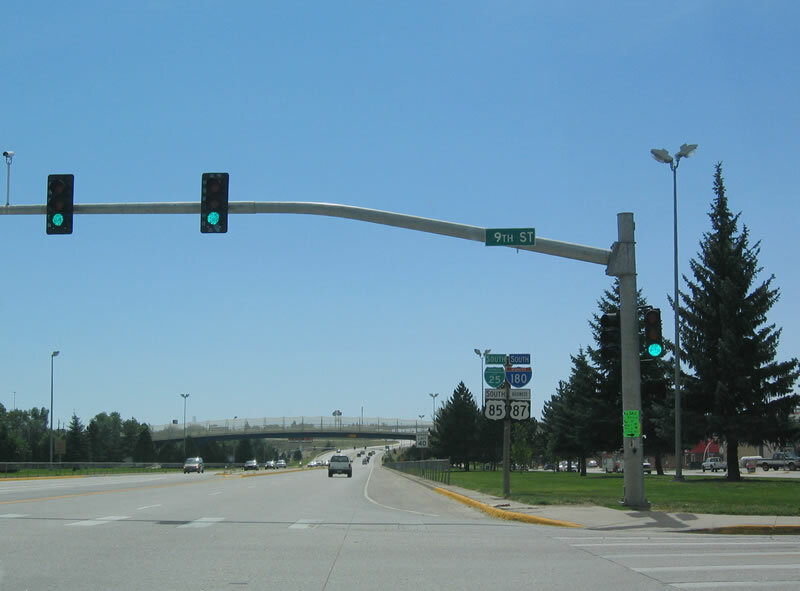 After the Crow Creek bridge, Interstate 180 and U.S. 85 approach the Fifth Street traffic signal. Photos taken 08/02/10 and 09/07/05. 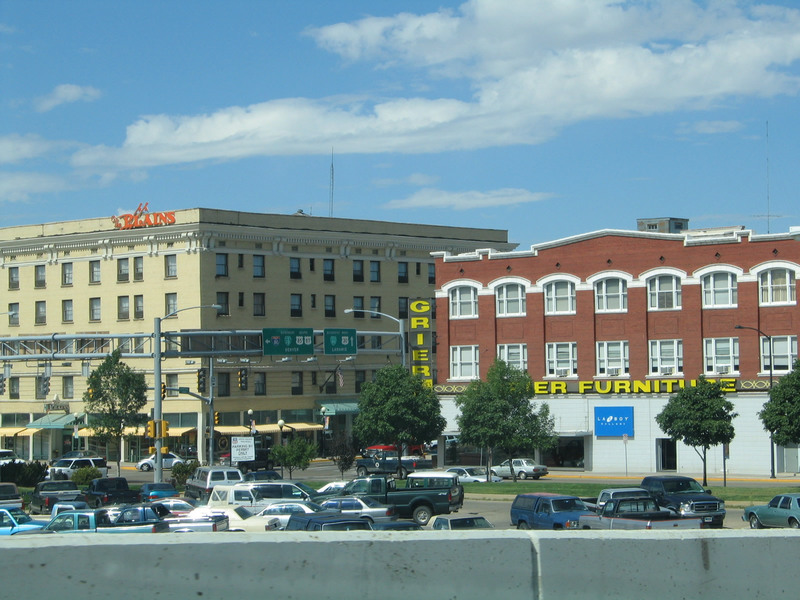 Northbound Interstate 180, Business Loop I-25, U.S. 85, and Business U.S. 87 reach Fifth Street. On either side of the highway, a wide greenbelt corridor separates Interstate 180 from its frontage roads. Trees are planted within the greenbelt. Photo taken 09/07/05. 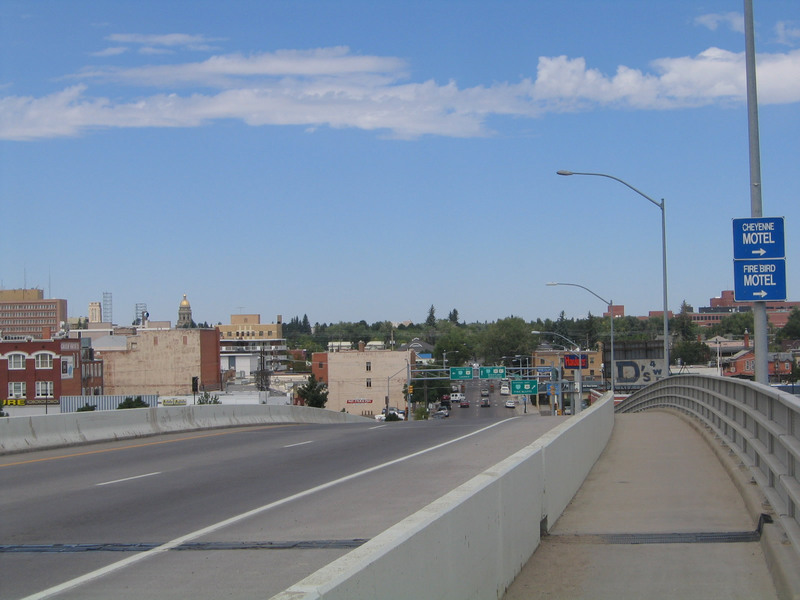 Interstate 180, Business Loop I-25, U.S. 85, and Business U.S. 87 pass under a pedestrian bridge. Photo taken 09/07/05. The next intersection along northbound Interstate 180 and U.S. 85 is Ninth Street. Photo taken 09/07/05. 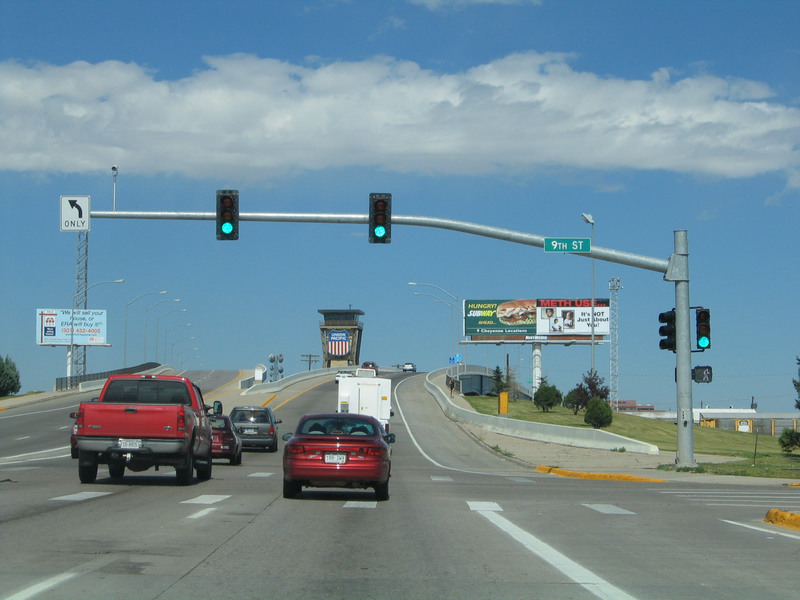 Northbound Interstate 180, Business Loop I-25, U.S. 85, and Business U.S. 87 meet Ninth Street at this traffic signal. The viaduct over the Union Pacific Railroad rises after the Ninth Street intersection. Photo taken 09/07/05. Still at the Ninth Street traffic signal, we see some changes between 2005 and 2010. 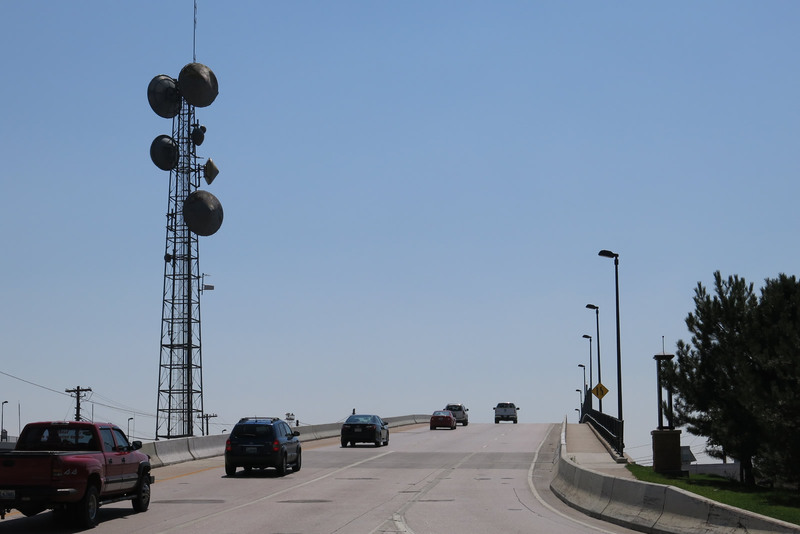 The street light poles had been replaced, and new advance route markers for the upcoming Business Loop I-80 junction were installed at the base of the Union Pacific Railroad viaduct. Photo taken 08/02/10. Leaving Ninth Street northbound Interstate 180 takes the Warren Avenue viaduct to cross the Union Pacific Railroad. A pair of Business Loop I-80 signs (erroneously, these shields say "Business Spur" rather than "Business Loop") is posted at the base of the viaduct. Stay left for Business Loop I-80 and U.S. 30/Lincolnway west or right for Business Loop I-80 and U.S. 30/Lincolnway. 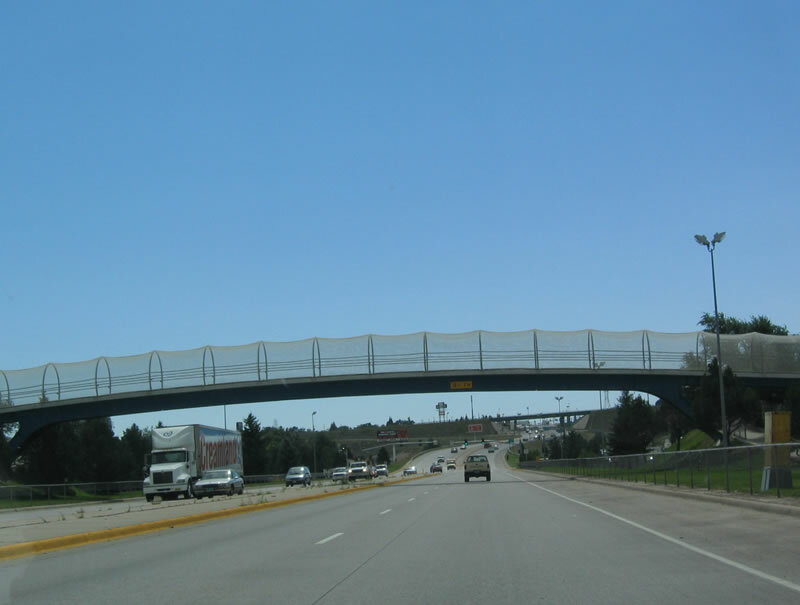 Warren Avenue will continue ahead for U.S. 85, Business U.S. 87, and Business Loop I-25. Photo taken 08/02/10. 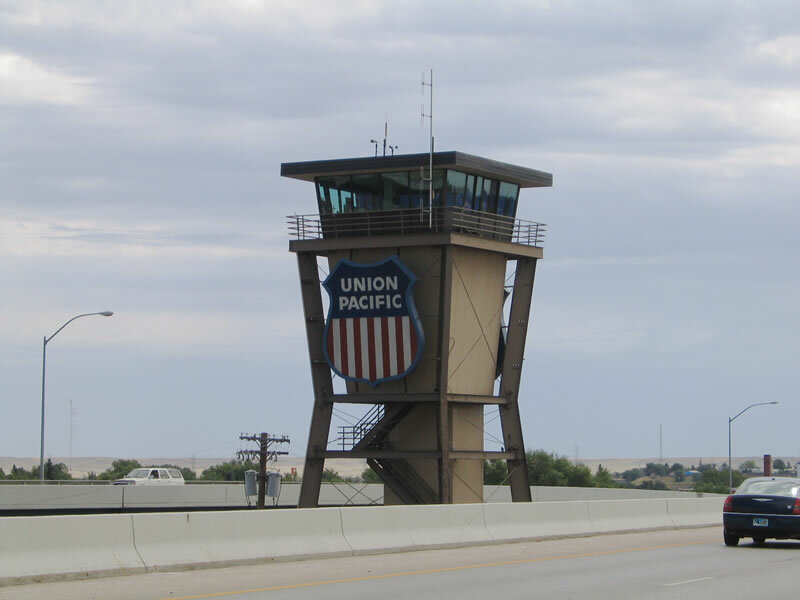 A control tower regulates the flow of train traffic through the Union Pacific railyard. It is located strategically between the two viaducts that comprise the twin carriageways of Interstate 180 as the highway crosses the railroad yard. Photos taken 08/02/10 and 09/07/05. Interstate 180 proceeds north over the railroad yard via the long viaduct. New lighting and fencing were installed between 2005 and 2010. Photos taken 08/02/10. Northbound Interstate 180/Central Avenue approaches its final junction, the intersection with Lincolnway (Junction Business Loop I-80 and U.S. 30). Lincolnway follows the north side of the railroad. Turn left on Lincolnway to downtown and the historic rail depot. The approaching junction is first identified by these two business loop shields. These shields were gone by 2010. Photos taken 09/07/05. 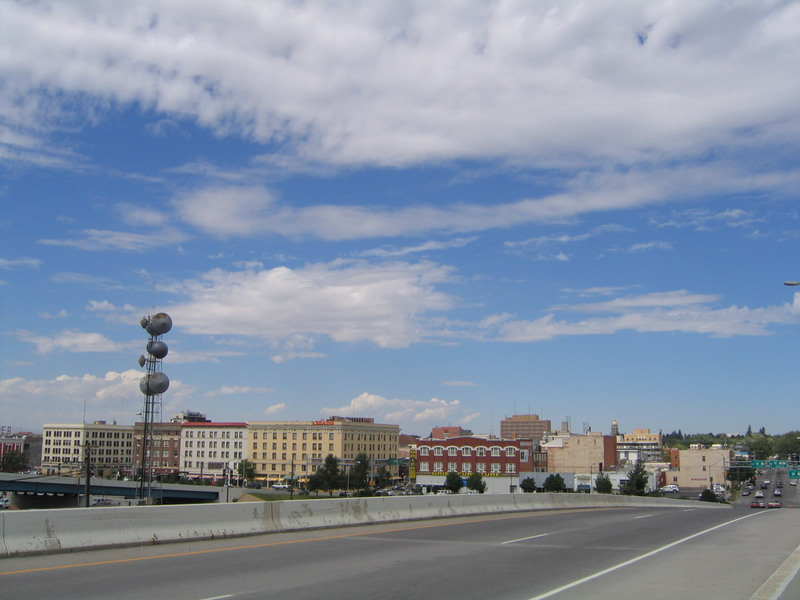 Downtown Cheyenne spreads out as Interstate 180 descends from the viaduct onto Warren Avenue northbound. The state capitol is readily identifiable by its golden dome. Photos taken 08/02/10 and 09/07/05. For some reason, the Cheyenne Motel and Freebird Motel are provided blue service signs, even though no other motels are afforded such an advertisement. Our guess is that they paid to have their names posted here. Photo taken 09/07/05. 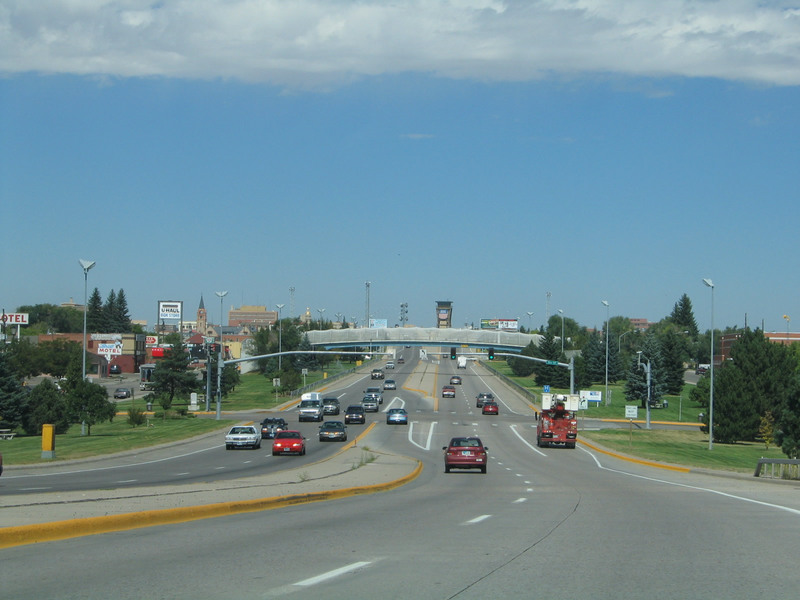 The intersection with Lincolnway (Business Loop I-80 and U.S. 30) comes into view on northbound Interstate 180, Business Loop I-25, U.S. 85, and Business U.S. 87. 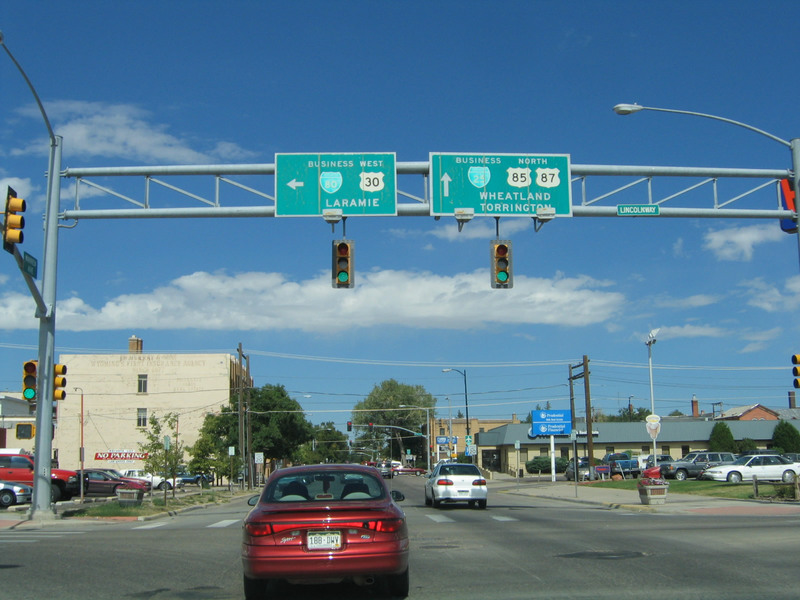 Use both lanes for through traffic onto Warren Avenue (Business Loop I-25), the left lane for westbound U.S. 30, and the right lane for eastbound U.S. 30. Photo taken 09/07/05. A short offramp connects northbound Interstate 180 with eastbound Business Loop I-80 and U.S. 30. 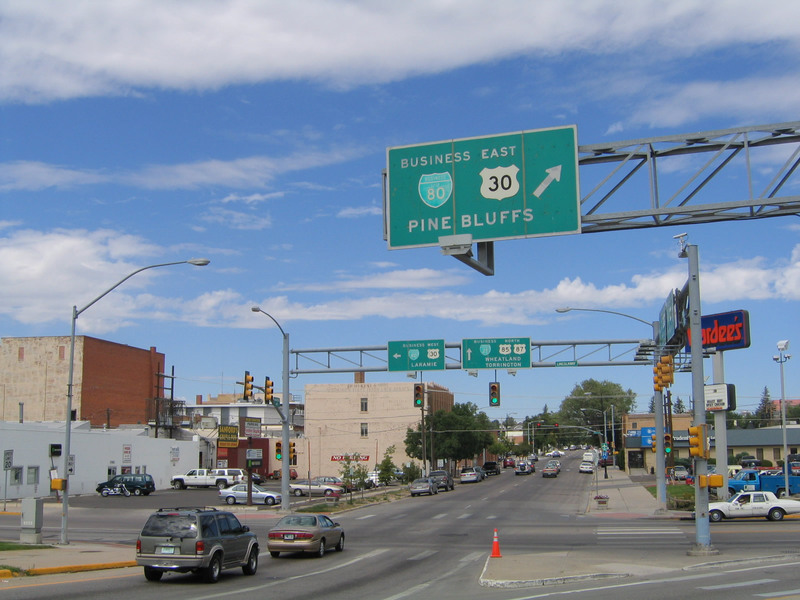 The control city for U.S. 30 is Pine Bluffs, which is located on the Nebraska-Wyoming state line. Photos taken 08/15/13 and 09/07/05. 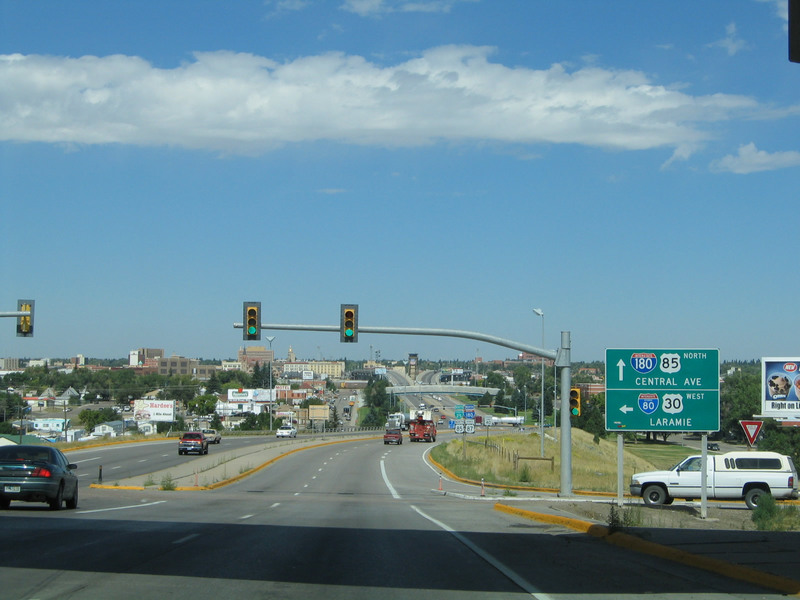 Immediately thereafter, a left turn is required to turn onto westbound Business Loop I-80 and U.S. 30 (Lincolnway/16th Street) en route to Laramie. 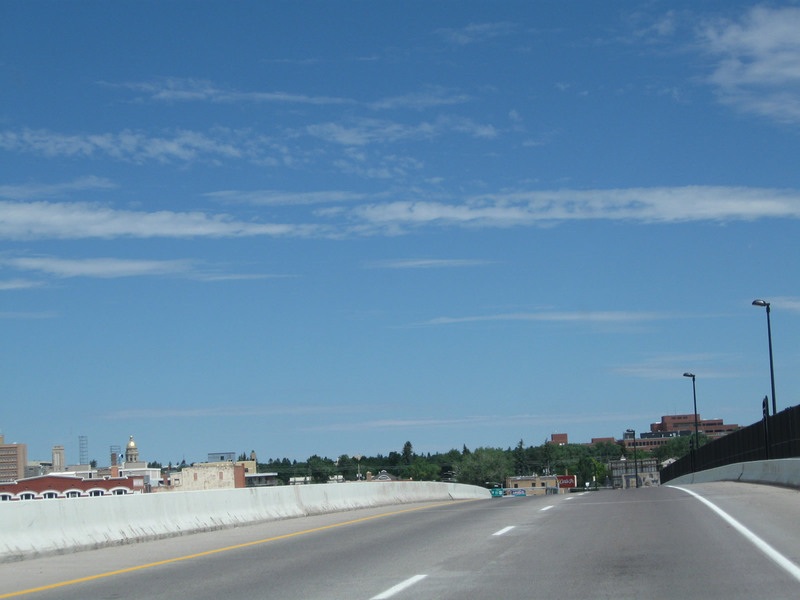 Both lanes continue north on Warren Avenue as Business Loop I-25, U.S. 85, and Business U.S. 87. Interstate 180 ends here, even though the route terminus is not signed. Photos taken 08/15/13 and 09/07/05. 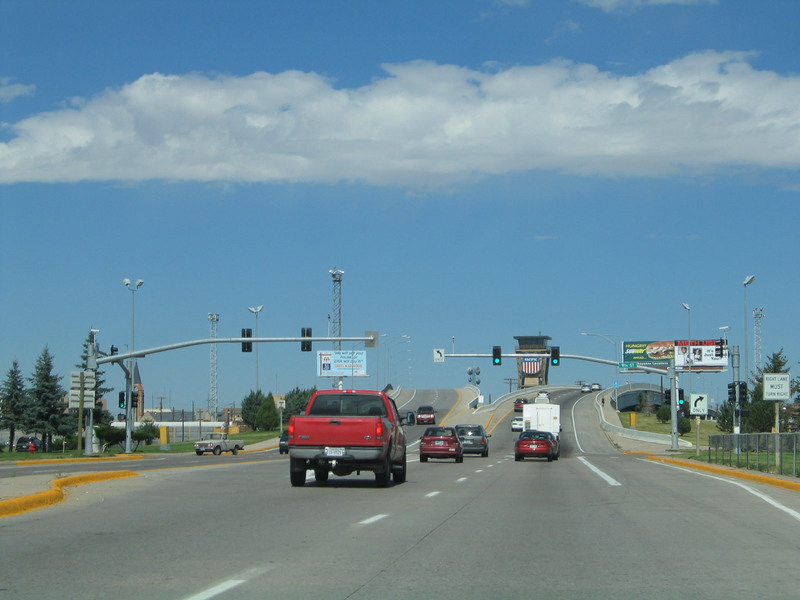 Interstate 180 begins its southbound journey alongside Business Loop I-25, U.S. 85, and Business U.S. 87 after the intersection with Lincolnway (U.S. 30 and Business Loop I-80). Photo taken 08/15/13. 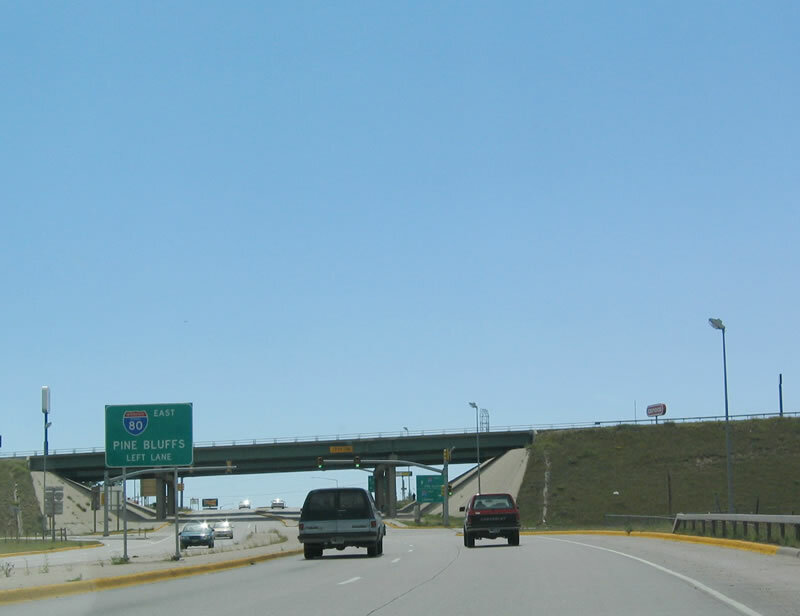 Before 2008, this was the first set of reassurance shields found along southbound Interstate 180, Business Loop I-25, U.S. 85, and Business U.S. 87. At that time, the Interstate 180 shield was the only standalone, state-name Interstate 180 shield. In 2008, this shield assembly was removed and not replaced, perhaps due to the installation of new bridge lighting. Photos taken 09/07/05. 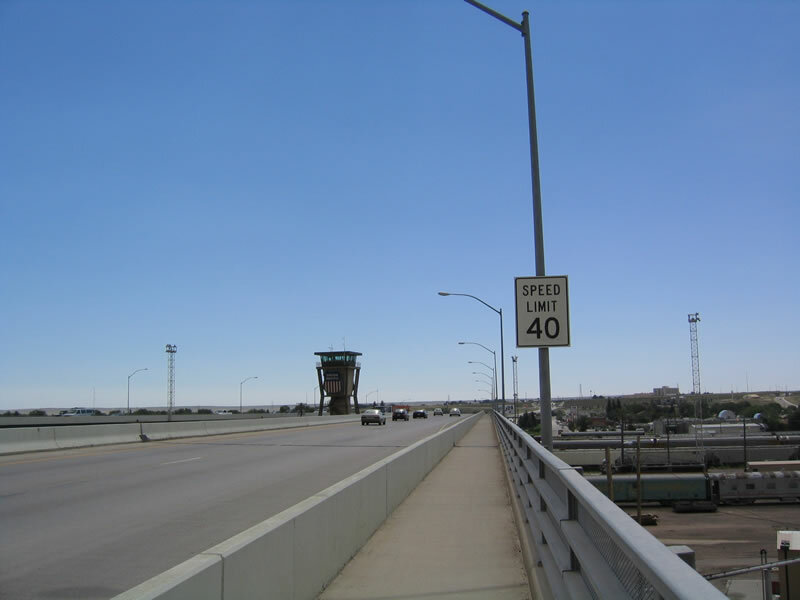 All of Interstate 180 has a 40-mile-per-hour speed limit, including the controlled access viaduct section between Business Loop I-80 and Ninth Street. Photos taken 08/02/10 and 09/07/05. 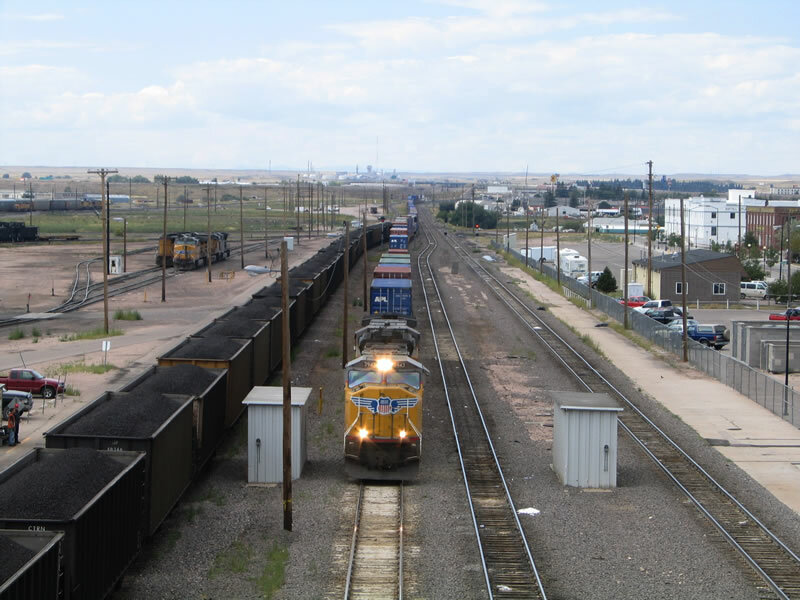 A control tower regulates the flow of train traffic through the Union Pacific railyard. It is located strategically between the two viaducts that comprise the twin carriageways of Interstate 180 as the highway crosses the railroad yard. Photos taken 09/07/05 and 08/02/10. Interstate 180 descends from the Union Pacific Railroad viaduct. Photo taken 08/02/10. 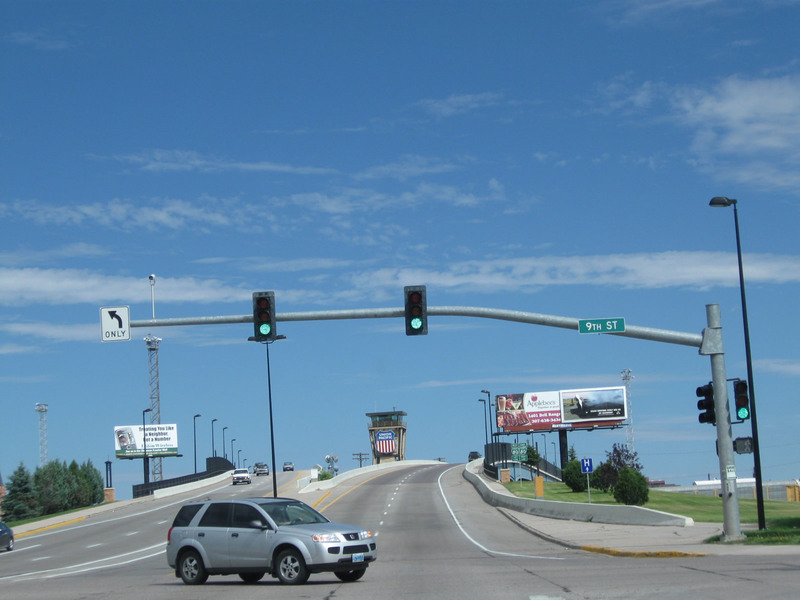 Southbound Interstate 180, Business Loop I-25, U.S. 85, and Business U.S. 87 reach the Ninth Street traffic signal after descending from the railroad viaduct. Photo taken 09/07/05. The Interstate 180 reassurance shield assembly is located after the Ninth Street intersection. It was state-named in 2002, but it was replaced with a neutered shield by 2004. This shield reversed a trend of adding more state-name Interstate shields in Wyoming after the 2001 experiment to add more neutered shields to the state's Interstate system. By 2012, the state name had been restored to this assembly (not shown here). Photos taken 08/02/10 and 02/03/02. 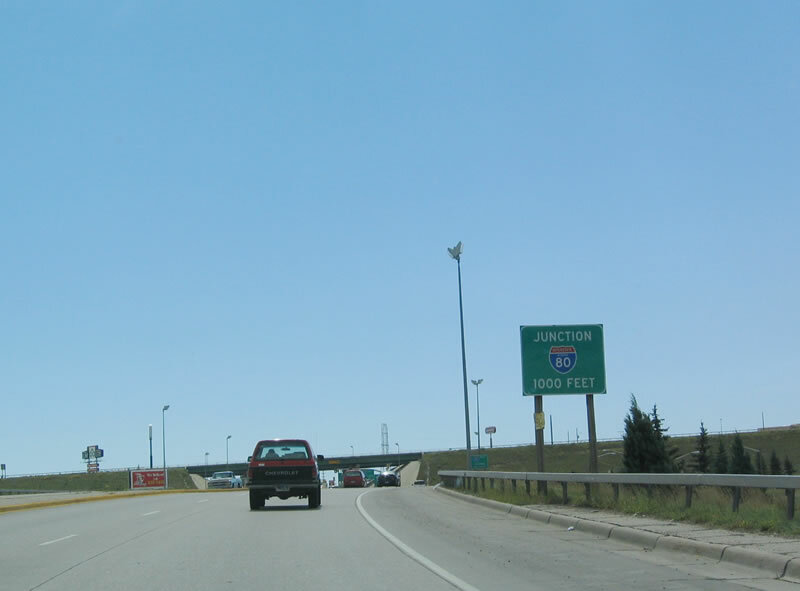 Interstate 180 is part of the Sand Creek Massacre Trail. Photo taken 08/02/10. 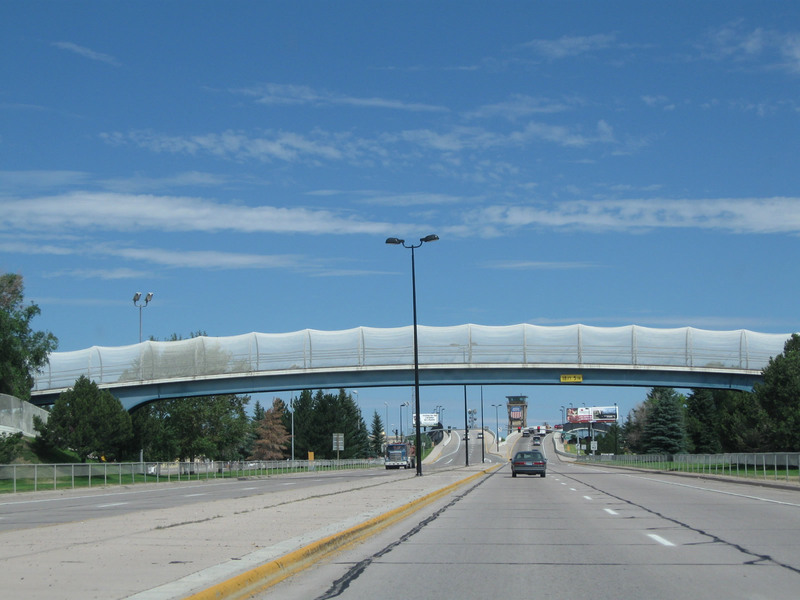 A pedestrian overcrossing passes over Interstate 180/Central Avenue. Photo taken 09/07/05. The next traffic signal along southbound is Fifth Street. Photo taken 09/07/05. Southbound Interstate 180 approaches its junction with Interstate 80 after the Fifth Street traffic signal. 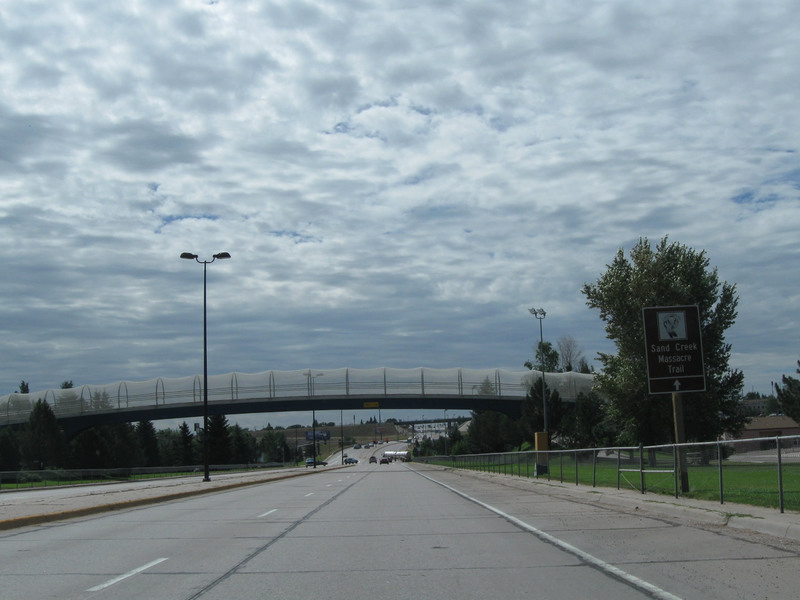 There is no connection from Interstate 180 to First Street, which passes under Interstate 180/Central Avenue near the bridge over Crow Creek. Photo taken 09/07/05. This is the viaduct over Crow Creek and First Street. Southbound Interstate 180 approaches its junction with Interstate 80. 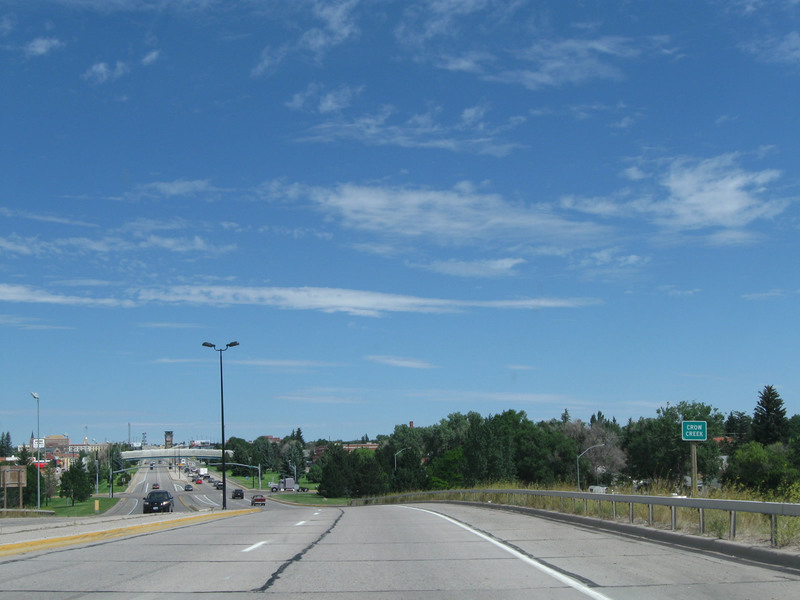 Turn right onto westbound Interstate 80 to Interstate 25 and to Laramie in Albany County. Photo taken 09/07/05. For traffic turning east onto Interstate 80 to Pine Bluffs and Omaha, use the left lane. Through traffic can use either lane to continue south on U.S. 85, Business U.S. 87, and Business Loop I-25. Photo taken 09/07/05. 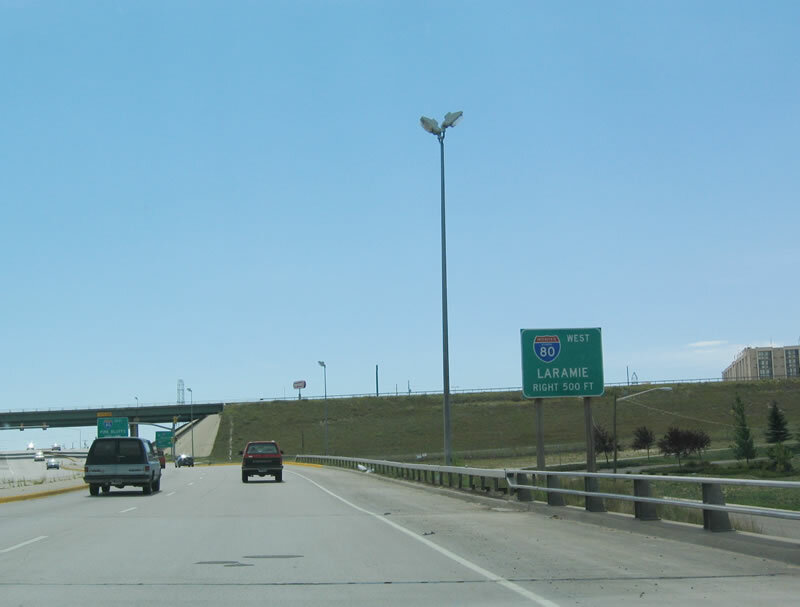 Southbound Interstate 180 reaches the ramp onto westbound Interstate 80 to Laramie and Rock Springs. 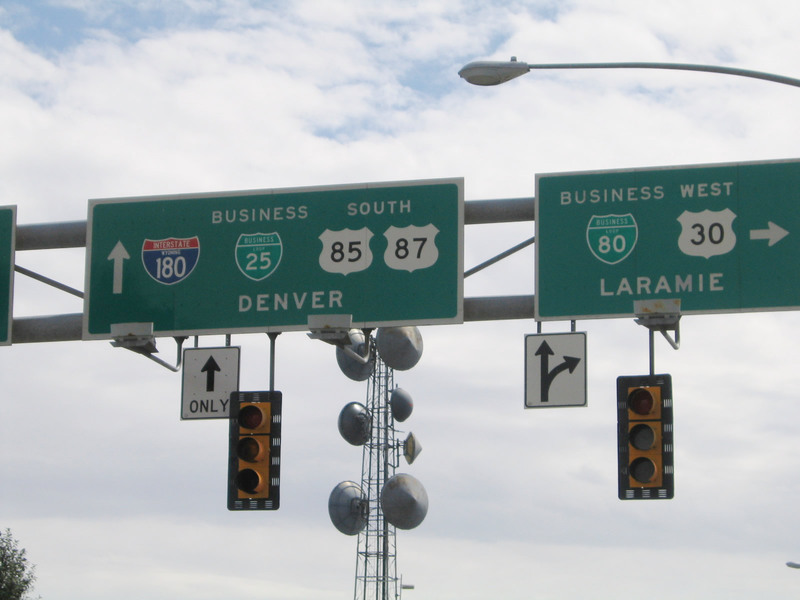 The control cities on this sign changed in 2008 to match the signs found at the Interstate 25 and Interstate 80 interchange. Photos taken 08/02/10 and 09/07/05. 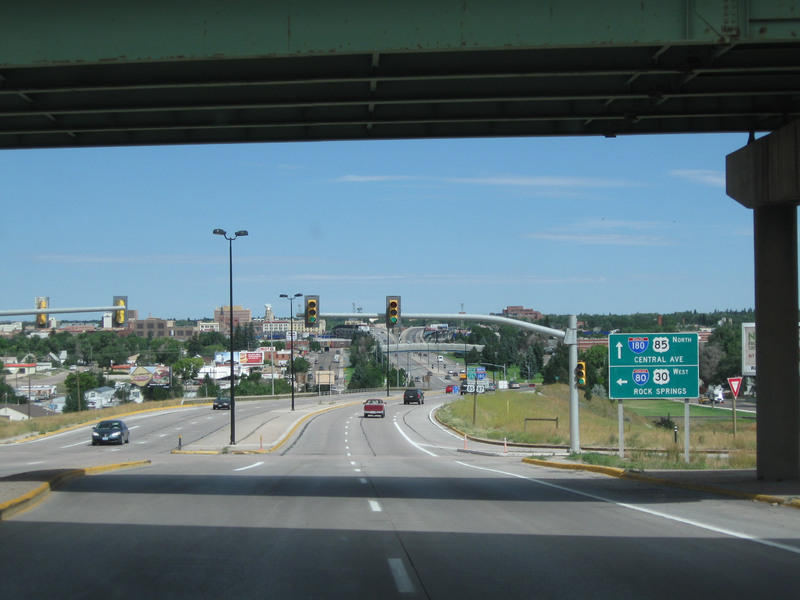 Interstate 180 comes to an end as Central Avenue passes under Interstate 80. Turn left here to follow Interstate 80 east to Pine Bluffs. 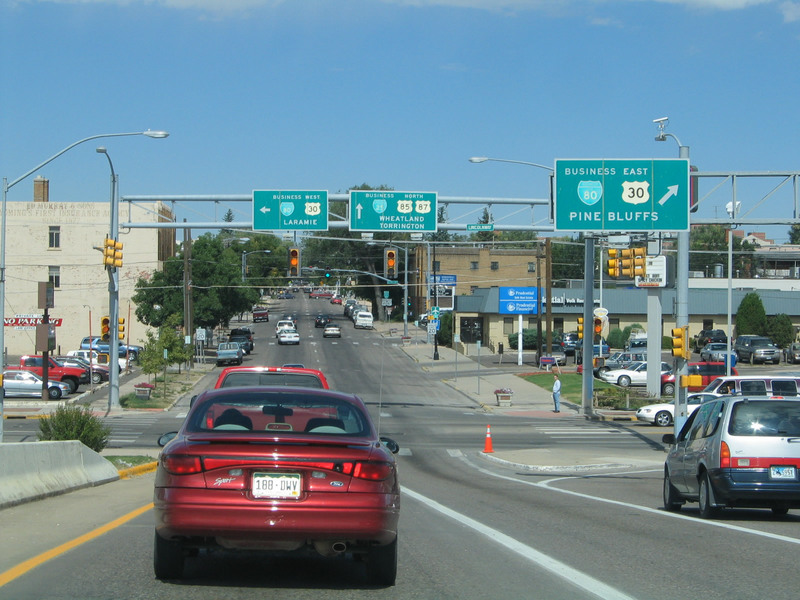 Central Avenue changes into South Greeley Highway (U.S. 85) en route to south Cheyenne and thence onward toward Colorado. Photo taken 09/07/05. 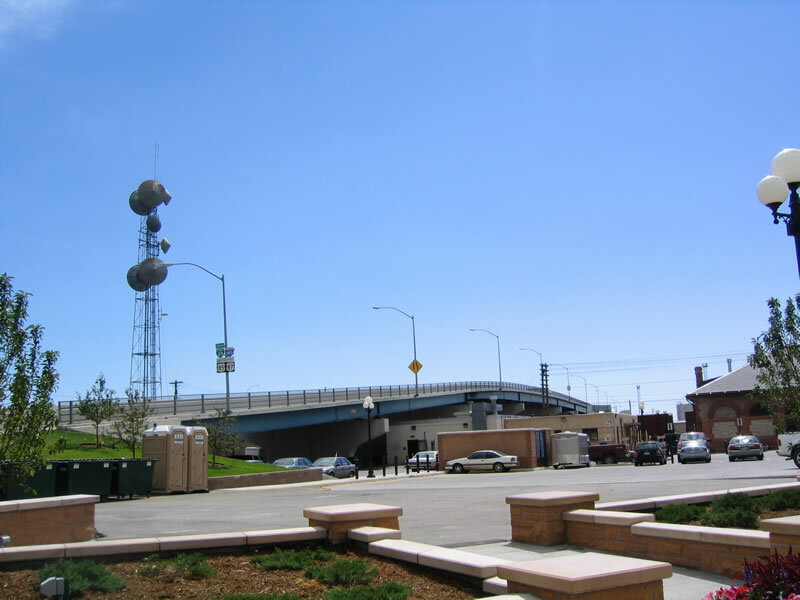 Two viaducts carry Interstate 180 (and Business Loop I-25, U.S. 85, and Business U.S. 87) over the Union Pacific Railroad. 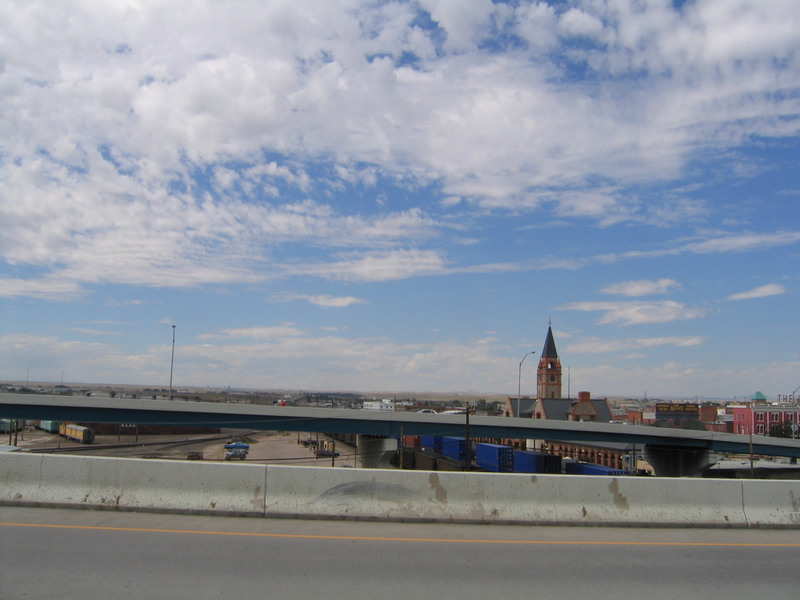 These bridges offer direct access into downtown Cheyenne from the south, and they cross over a huge railroad yard. 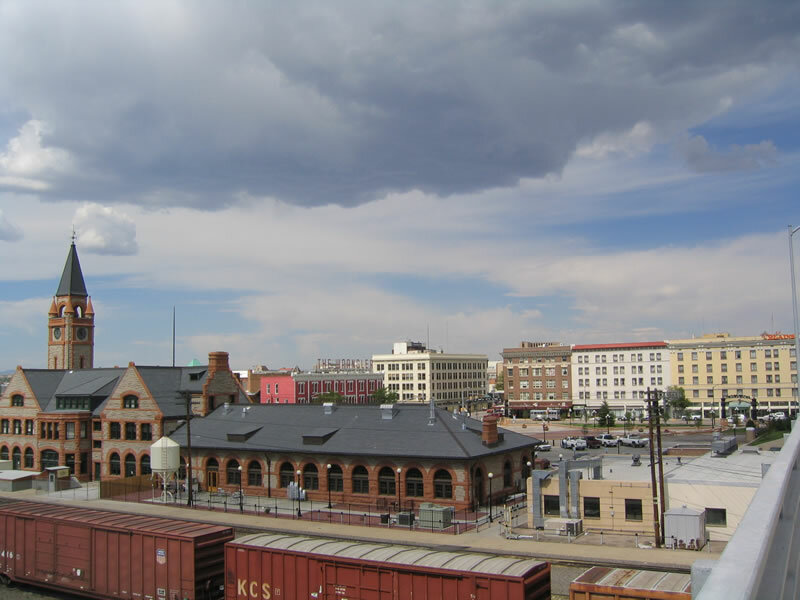 This view looks west from the southbound bridge toward the northbound bridge and Cheyenne Depot Plaza. Photo taken 09/07/05. 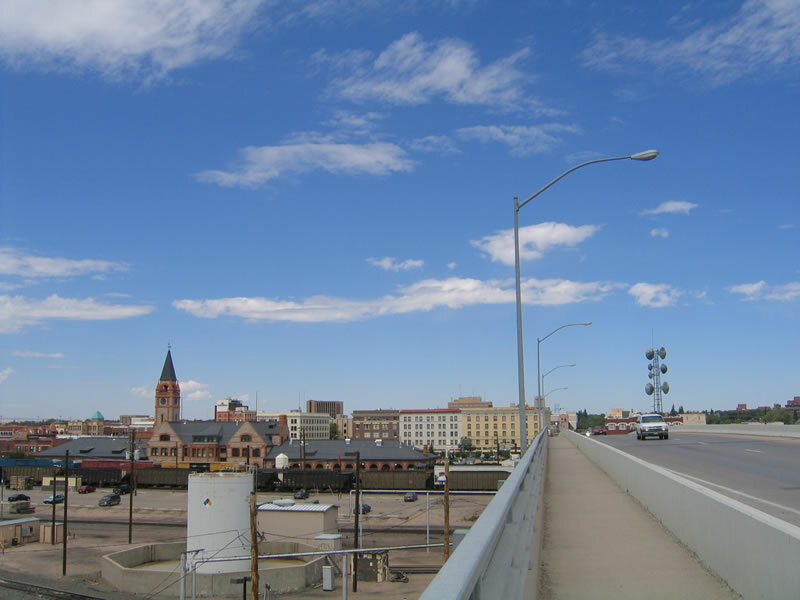 This view shows southbound Interstate 180, looking north, as seen from the sidewalk on the railroad viaduct in downtown Cheyenne. Photo taken 09/07/05. As seen from the plaza is this ground-level view of the Interstate 180 southbound viaduct over the Union Pacific Railroad, looking southbound. Photo taken 09/07/05. Unlike most Interstate highways, both viaducts on Interstate 180 have sidewalks. 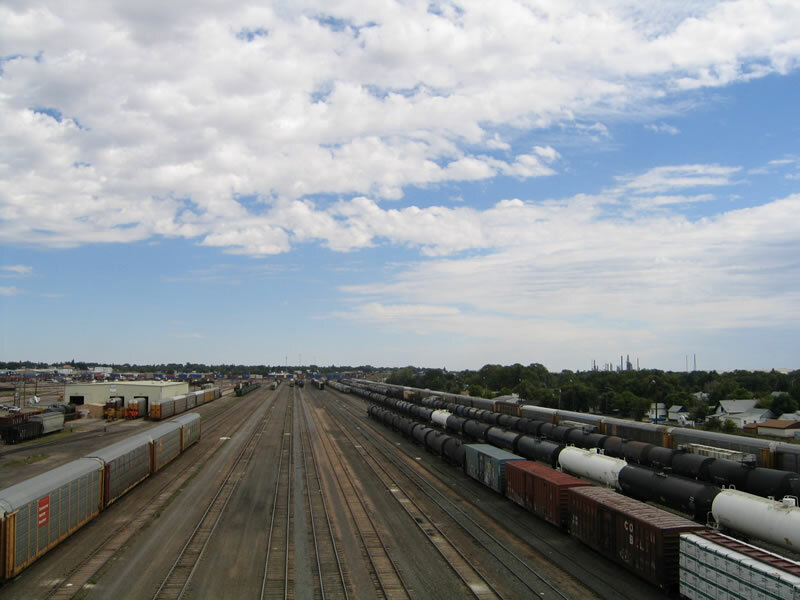 From the northbound viaduct are these views of the railroad yards looking east. Photos taken 09/07/05. 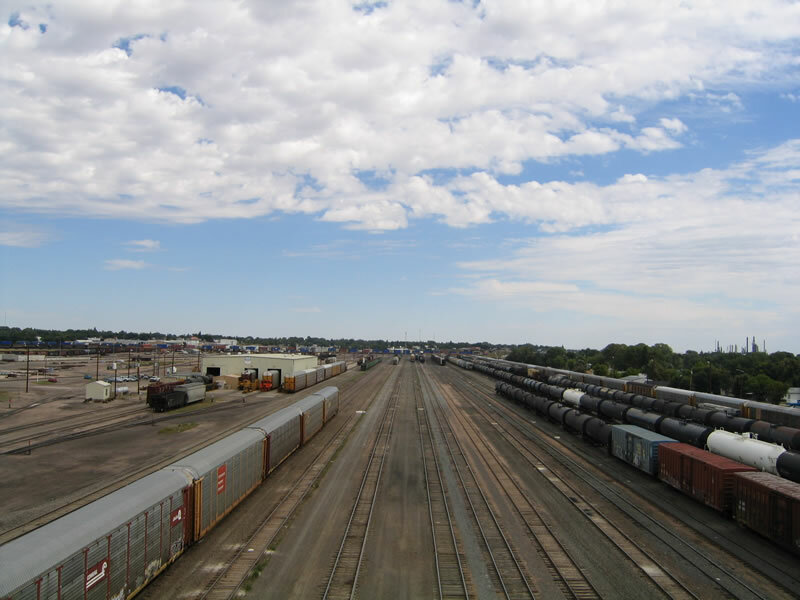 From the southbound viaduct are these views of the railroad yards looking west. Photos taken 09/07/05. 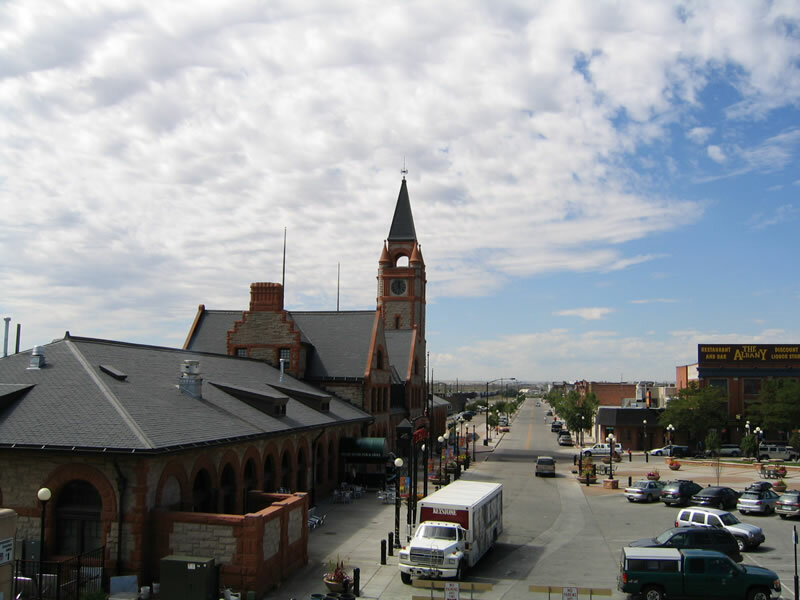 The historic buildings of downtown Cheyenne, including the railroad station, are visible from the sidewalk on the southbound viaduct of Interstate 180 looking toward the north. Photos taken 09/07/05. 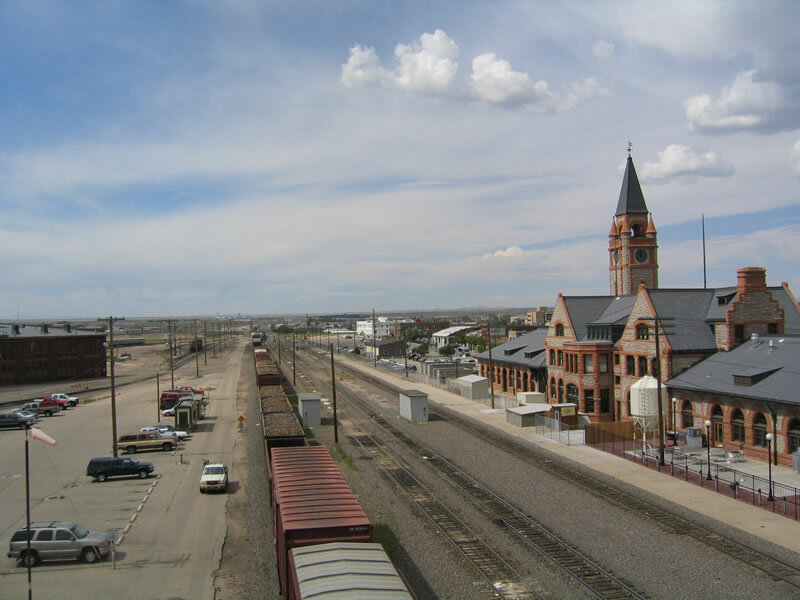 The rail station in Cheyenne is situated on the north side of the tracks, to the west of the Interstate 180 viaducts. A large plaza and concrete area are located between the rail station and Lincolnway (U.S. 30 and Business Loop I-80). Photos taken 09/07/05. Page Updated September 14, 2014.